Ma fille cadette annonce sa venue à la maison avec ses enfants. 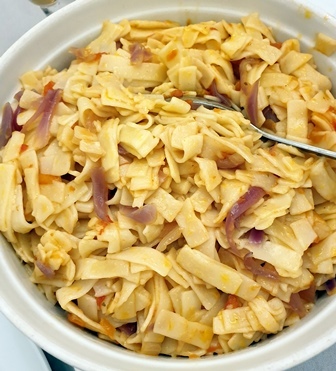 Le dîner est organisé sur l’instant et nous mangerons des tagliatelles aux oignons. 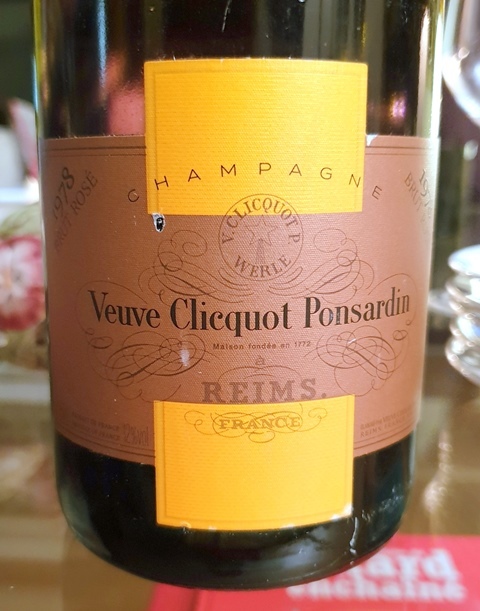 J’ouvre un Champagne Veuve Clicquot Ponsardin Cave Privée rosé 1989. La couleur est d’une grande beauté. 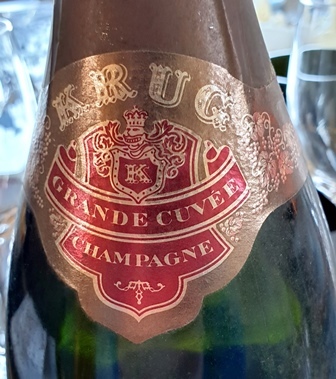 Le champagne est vif, plein et surtout il montre une aptitude gastronomique extrême. On le voit volontiers rivaliser avec de belles viandes roses. 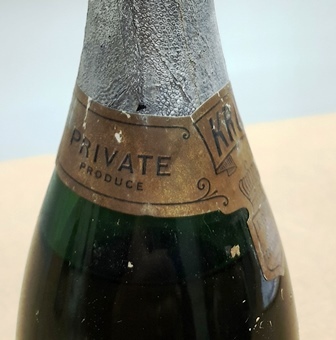 Nous nous réjouissons de ce beau champagne généreux, raffiné et gourmand qui laisse une longue trace en bouche. Le lendemain midi, le cercle s’élargit à ma fille aînée et ses deux filles. De tôt matin j’ai ouvert deux vins rouges assez inhabituels que j’ai envie de goûter avec mes filles, « pour voir ». 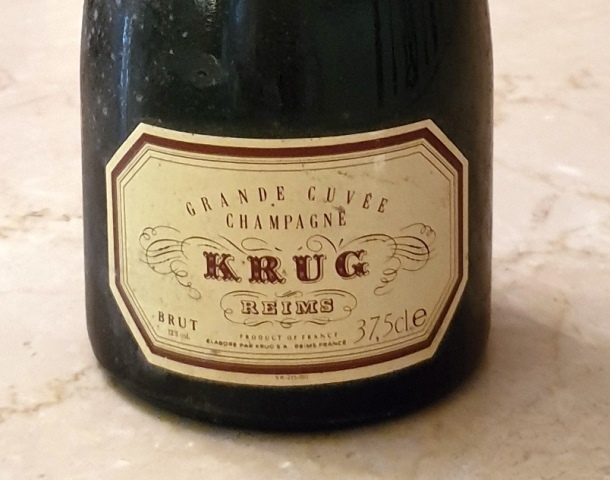 Pour l’apéritif qui consiste en des petits crackers pimentés puis deux belles quiches lorraines, j’ai ouvert un Champagne Krug Grande Cuvée étiquette crème qui a plus de vingt ans. La bulle est grosse, mais c’est sans doute lié au verre qui est un verre plutôt fait pour les rouges. La couleur est légèrement et joliment ambrée. D’emblée, l’attaque du champagne vif est noble. C’est un chevalier paré de son armure étincelante qui entre en lice pour emporter le cœur de la dame de ses pensées. Il est puissant, racé et complexe mais il est rassurant. 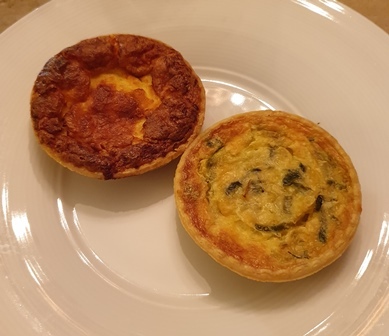 Le champagne accompagne ensuite un cœur de saumon fumé gras et délicieux, mais il était plus à son aise sur la quiche. 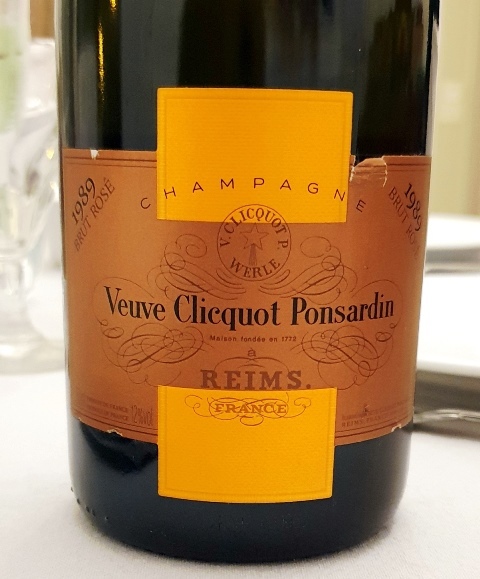 C’est un champagne de grand raffinement et intense. Les deux vins rouges ont été pris dans ma cave à l’instinct. Pourquoi eux, je ne sais pas. Je les ai carafés pour ne pas influencer l’opinion de mes filles. 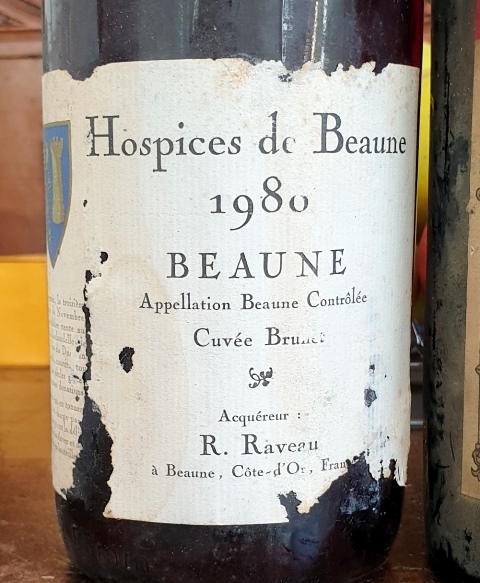 Le Beaune Hospices de Beaune Cuvée Brunet de R. Raveau 1980 a un nez discret et pur. Il annonce une belle subtilité. En bouche on sent un goût légèrement salé très agréable. Il n’est pas très large, mais il est plaisant. 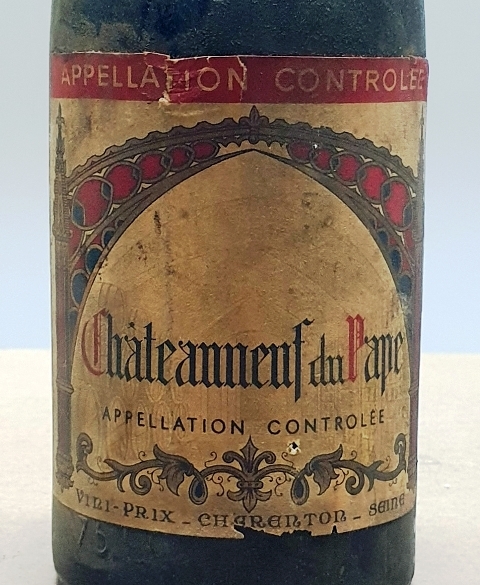 A côté de lui est servi un Châteauneuf-du-Pape Vin fin d’Origine Vini-Prix à Charenton sans année que l’on peut situer dans les années 60 ou à la fin des années 50. Pourquoi ai-je acheté cette bouteille, je ne sais pas, sans doute dans un lot disparate. Le nez est très engageant, riche et profond, et ce dès l’ouverture il y a près de quatre heures. Le vin bu à l’aveugle par mes filles leur plait beaucoup et elles pensent à un vin du sud. 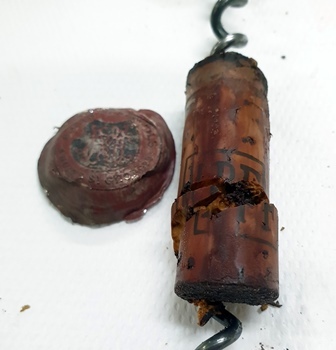 Il m’apparaît comme une évidence que ce vin est un Châteauneuf-du-Pape qui a été fortifié par un vin d’Algérie, car il est riche et lourd et il y a des accents de café très caractéristiques. 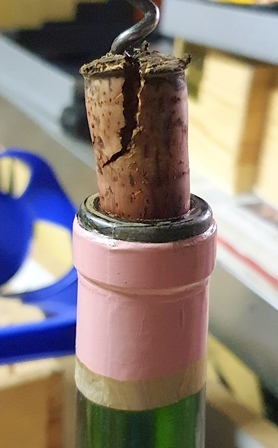 Et ce vin est très agréable à boire, car on ne lui demande pas son pedigree. Je suis content que mes filles aient bien réagi sur ces deux vins, avec un esprit ouvert. 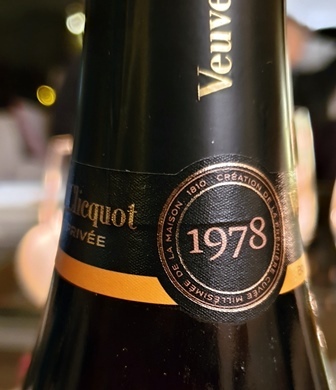 Cette petite expérience était amusante, et le vin de Vini-Prix s’est bien comporté aussi sur un gâteau au chocolat réalisé par la plus jeune de mes petites-filles. C’est un beau déjeuner de famille avec des vins hors des sentiers battus. le bouchon était enfoncé dans le goulot. le tirebouchon n’a tiré que des miettes. Il a fallu cureter pour enlever toutes les miettes de bouchon. Cette entrée a été publiée dans dîners ou repas privés le 19 février 2019 par François Audouze. My friend Tomo receives offers from wine sellers many of which are the same ones that I receive. 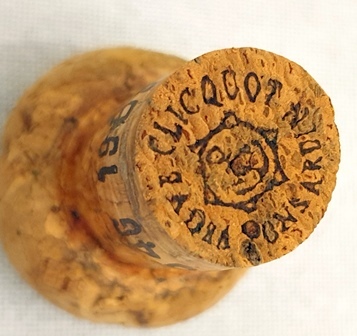 An offer from a Romanée-Conti appeals to me but the price seems to me dissuasive. 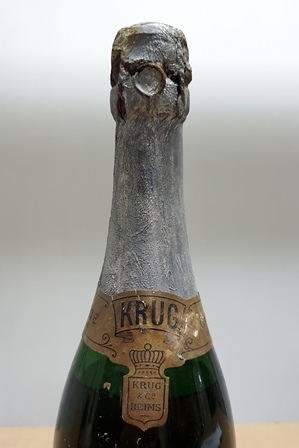 I would like to buy this bottle for drinking and I suggest Tomo that we buy it for two to share. Tomo had also decided not to follow the offer for himself and I propose the joint acquisition, which is still a madness. We decide to be crazy. The bottle is delivered by the merchant to the restaurant Garance where we will have dinner, Tomo and me. Tomo offers me to add a Montrachet and I propose to add a white Musigny. 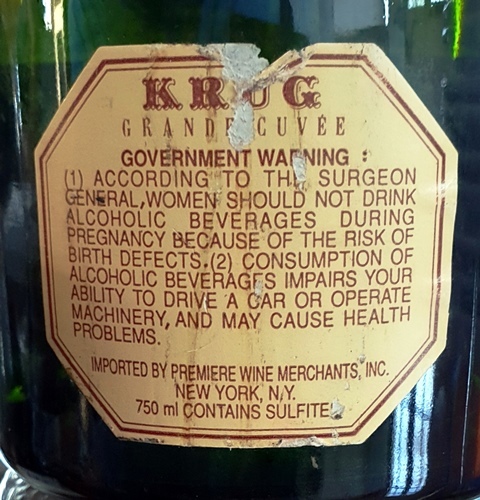 The cause is heard and at 6 pm we meet at the restaurant to open the bottles. 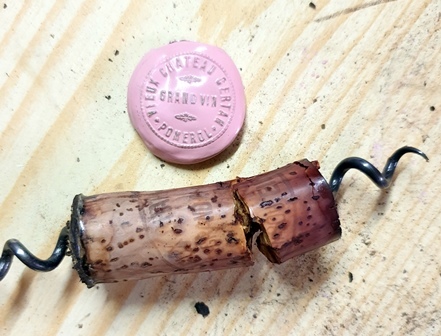 The wines are young and the opening does not cause any problem. 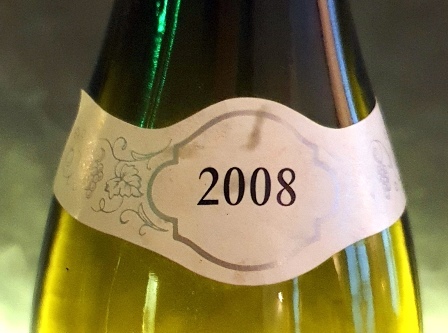 The perfume of Montrachet Domaine Ramonet 2008 is a bomb of rich fragrances. This wine explodes with generosity. 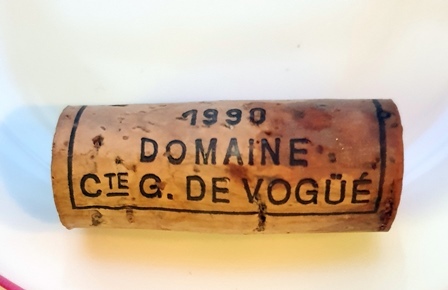 The White Musigny Domaine Comte Georges de Vogüé 1990 has a calmer and more intense scent. He promises beautiful things. 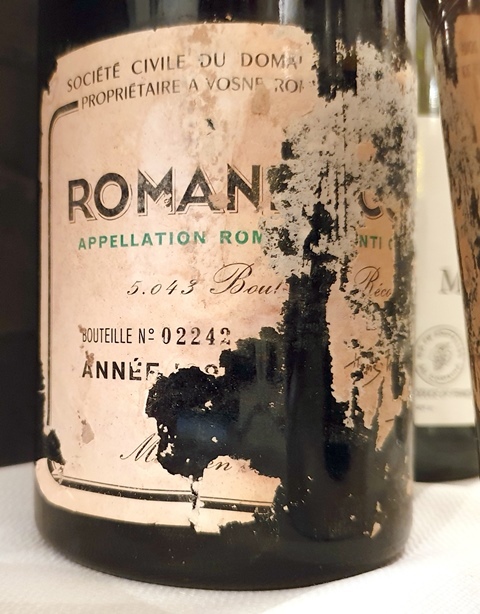 The Romanée-Conti Domaine Romanée-Conti 1991 has a discreet perfume of a beautiful nobility. The three wines seem consistent with what we can expect. Everything is fine. Guillaume Muller director of the restaurant offers glasses of Champagne Dhondt-Grellet extra brut non vintage. 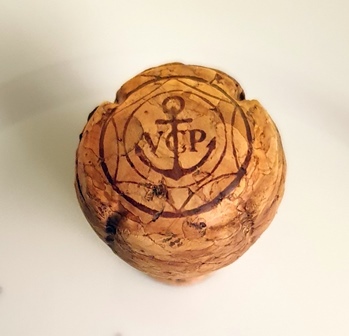 This champagne is a very happy surprise because it does not have the character sometimes ungrateful champagnes ultra brut. He is very precise and well done. I meet Alexis Bijaoui, the new chef who replaces Guillaume Iskandar. He is 29 years old and recently worked at Arpège. He is extremely friendly. We have time to prepare our menu. We will take two common dishes, the first and the third, and we will differ on the choice of the second. My menu will be: Scallops served in shells, black truffle and juniper wood sauce / Pork square, pressed potato, simmered and hazelnut sabayon / smoked duck then lacquered, risotto of turnip golden ball and buckwheat. Before dinner Tomo wants to taste the two whites and the chef prepares foie gras toasts with excellent toast, gourmet buns and beetroot pies. 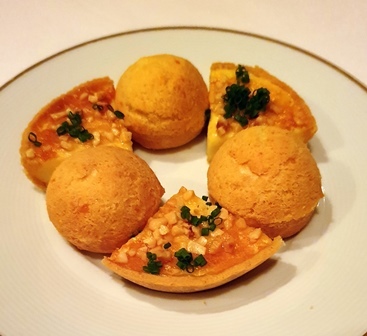 These small nibbles of aperitif show the beautiful sensitivity of the chef. 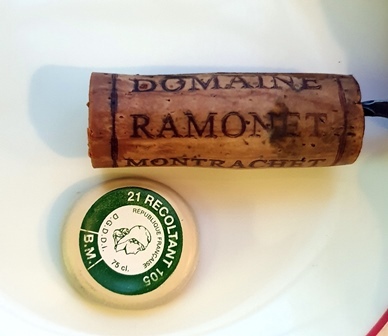 The Montrachet Domaine Ramonet 2008 is still an olfactory bomb. 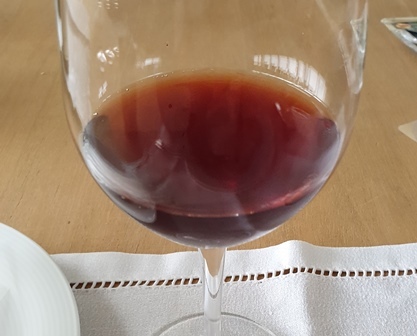 It is so young that it smells petrol, which will fade with the enlargement of the wine in the glass. 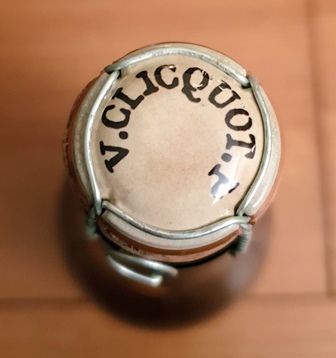 On the palate the wine is round, generous, full and rich and has a communicative joie de vivre. 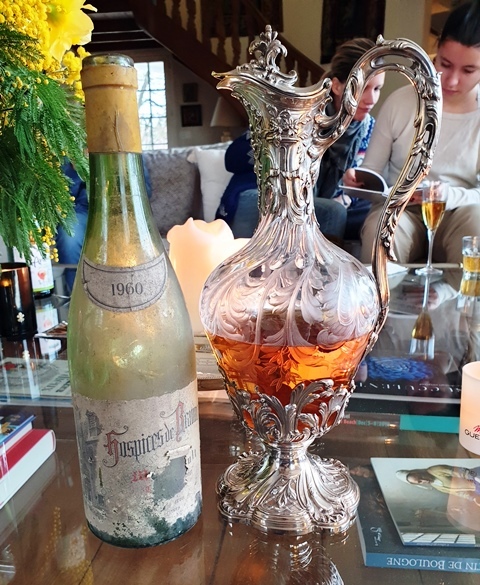 It is really a generous Montrachet like certain years of the Montrachet of the Romanée Conti of which it has the power. 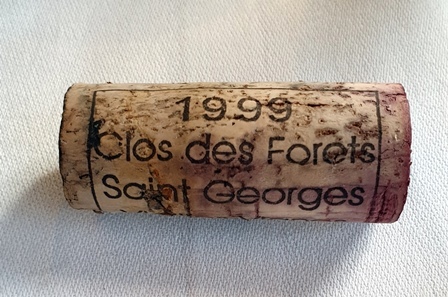 The White Musigny Domaine Comte Georges de Vogüé 1990 has a racy and deep nose. In the mouth what strikes is that it is incisive and sharp, leaving a very long trace in the mouth. It is deep when the Montrachet is round. They are extremely dissimilar. 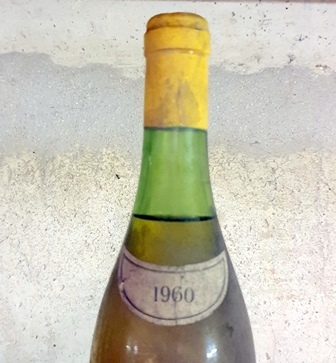 Because of the age, the Musigny is more gastronomic and interesting, but the Montrachet in his youth is catchy. 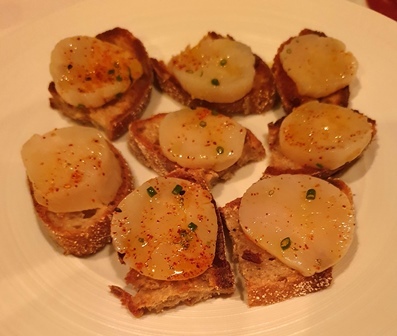 Tomo says he has never eaten such good scallops and it is true that they are succulent, almost raw, barely cooked, so that the sweetness of the shell is still present. 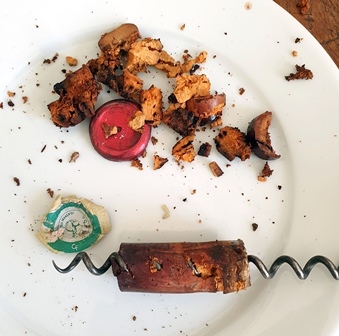 The agreement with the truffle is relevant and on the shell alone, the Montrachet is perfect. 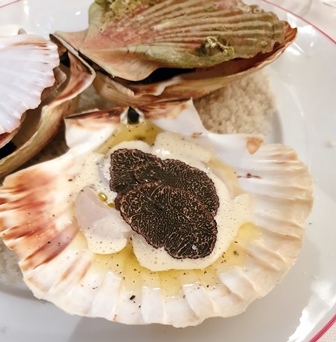 On the shell associated with truffles, Musigny is the most relevant. 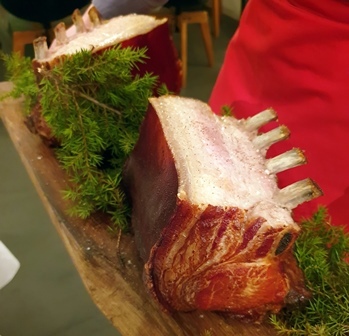 The pig and its generous fat are succulent. It is the Musigny that is most relevant and the preparation of the potatoes tastes too strong for wines that require more sweetness. We feast with these two disparate white wines that flourish in glasses, taking more roundness for the Musigny and more mature for the Montrachet. 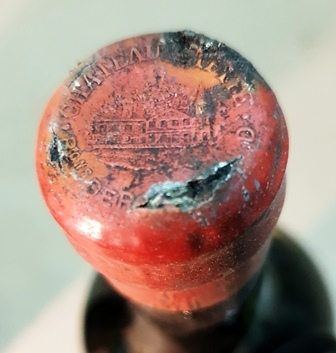 Tomo is so eager to taste the Romanée Conti that he stamps. So, although our glasses of white are not empty, we go to the discovery of red. 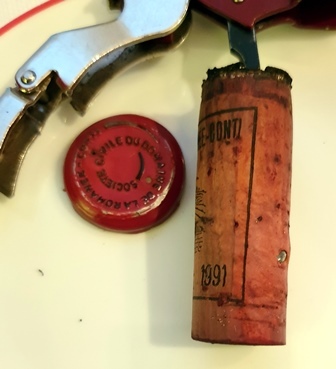 The Romanée-Conti Domaine Romanée-Conti 1991 has a clairette color for the top of the bottle, always clearer. 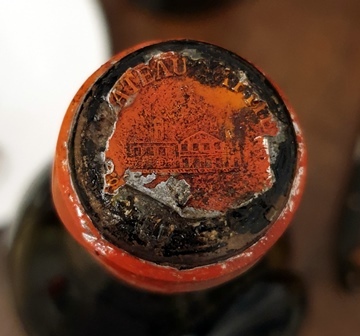 The level in the bottle was as high as possible, which weighed in my desire to acquire it. The nose is all in refined suggestion, it’s Aramis, the elegant mousquetaire. On the palate the wine is of a rare distinction. So we listen to it. And it’s a madrigal festival. He tells the map of the Tendre. It is, I think, one of the best of the young wines of the Domaine that I had the chance to drink. The advantage of being only two to drink a bottle is that you can come back to the wine and listen to it to infinity. 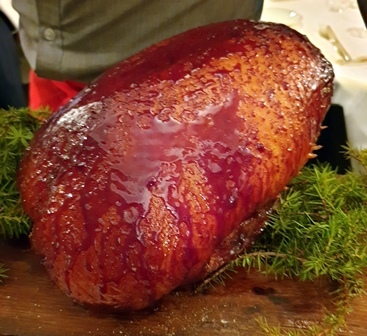 The duck has a superb flesh. The sauce is not suitable for wine because it is heavy. It would have taken a blood sauce but it must be said that we had not prepared this dinner at all. 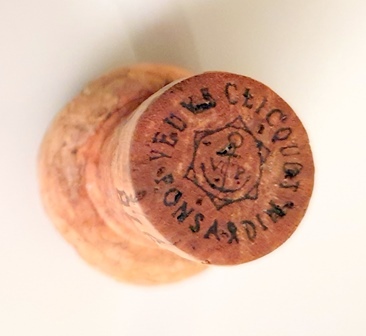 On the flesh alone, the Romanée Conti is a romance of love, strumming its subtleties with infinite grace. What happiness! 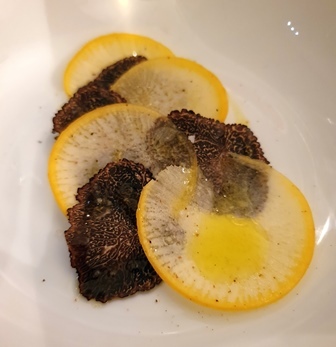 Salt, the usual marker of the Romanée Conti finding a particular resonance on thin slices of raw turnip, I ask to have a small plate of these raw slices to titillate the red wine, but they bring me slices of turnip and truffles soaked with an oil, which makes the agreement impossible. Too bad, it does not matter. 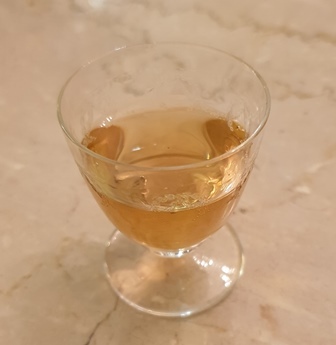 It remains in the three glasses of what to drink and the experience to which we will work is interesting. A saint-nectaire is a perfect ripening. 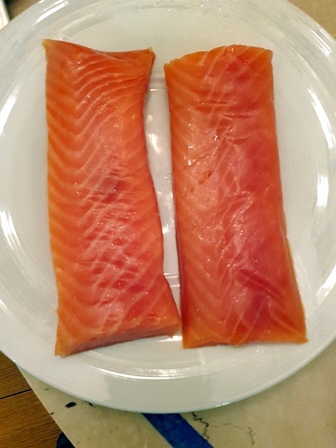 It is delicious and plays to perfection the role of resetting our palates. It’s incredible. 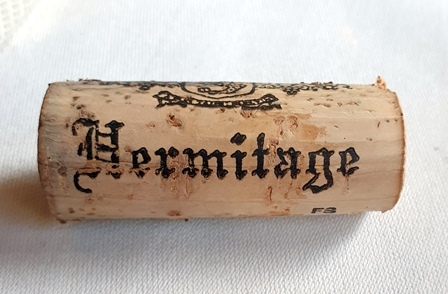 We drink one of the white wines, we eat a little saint-nectaire and the palate is like new and we can switch to red and vice versa. I never imagined such an efficient passage through the cheese box to allow travel between wines. 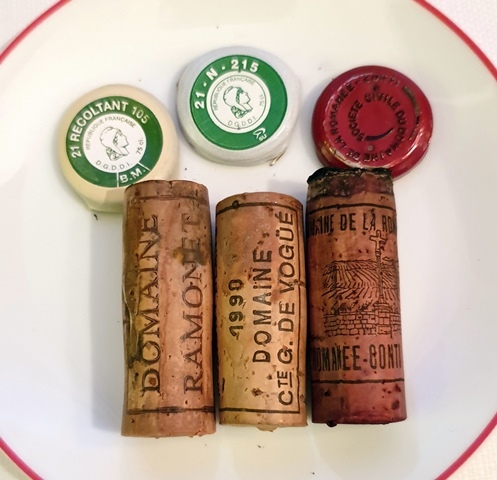 From this trip it appears that the Musigny is much more complex and deep than the Montrachet when this difference was not so sensitive at the beginning of meal and the second observation is that the Romanée Conti is transcendental compared to the two white wines. 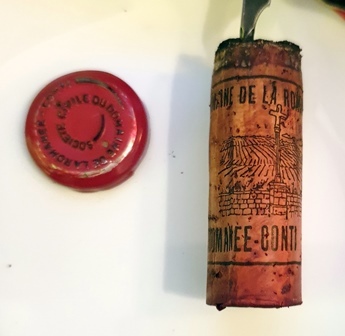 Romanee Conti like this are moments of absolute grace. 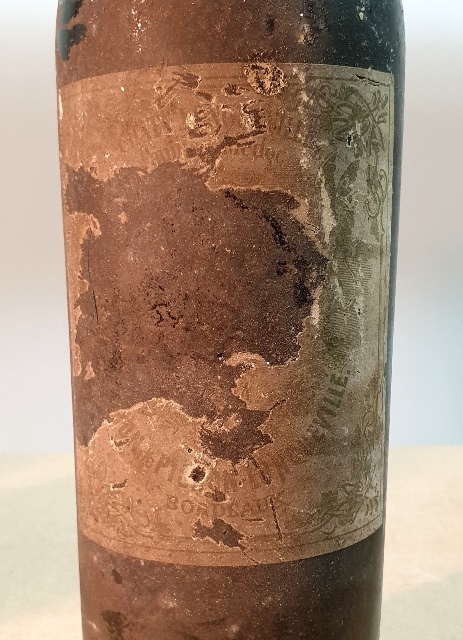 The seller of this bottle, which we know well had brought with the bottle a small tiny bottle announced as containing a Moscatel of the 19th century. 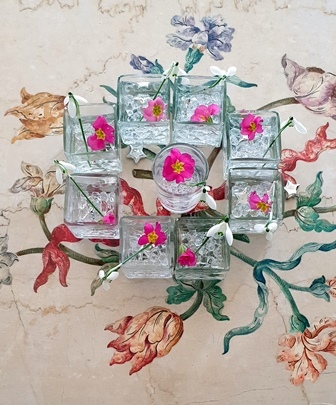 The liquid we drink is of infinite delicacy. 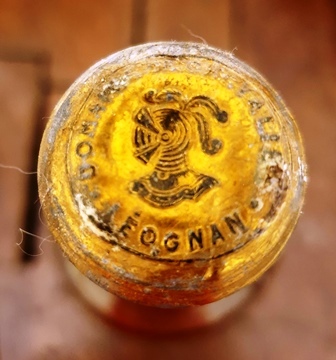 There is greasiness, creaminess, but there is above all a coherence and an accomplishment that only belong to sweet wines of more than a century. It could be from the Porto area, but I would see it from Madeira as well. 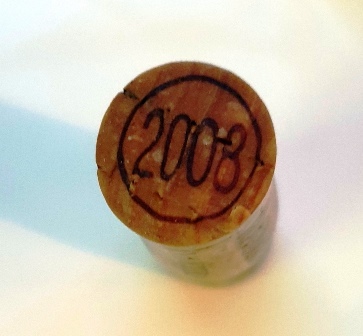 It was a nice end to a meal that will remain long in our memories as this Romanée Conti was so beautiful. 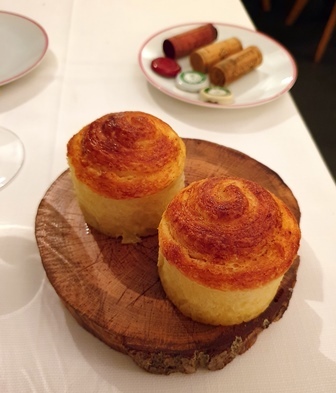 Guillaume Muller manages his restaurant with pertinence and Alexis shows a great talent in cooking. We cannot blame him for the temporary inadequacies with the wines, because we had not prepared anything and asked. At 29 Alexis will quickly bring a star to the restaurant Garance. So, let’s buy some crazy wines! Cette entrée a été publiée dans dîners ou repas privés le 14 février 2019 par François Audouze. Mon ami Tomo reçoit des offres de vendeurs de vins dont beaucoup sont les mêmes que celles que je reçois. 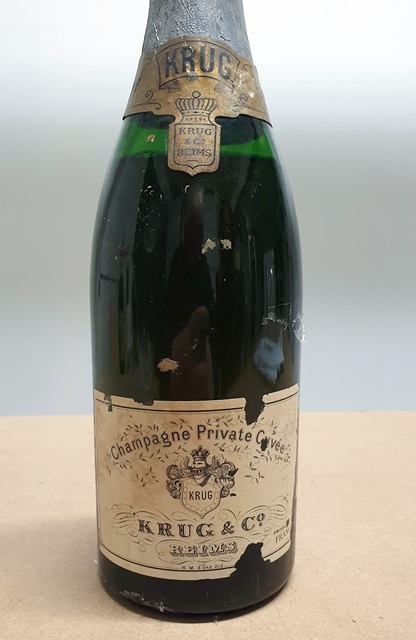 Une offre d’une Romanée-Conti m’interpelle mais le prix me semble dissuasif. 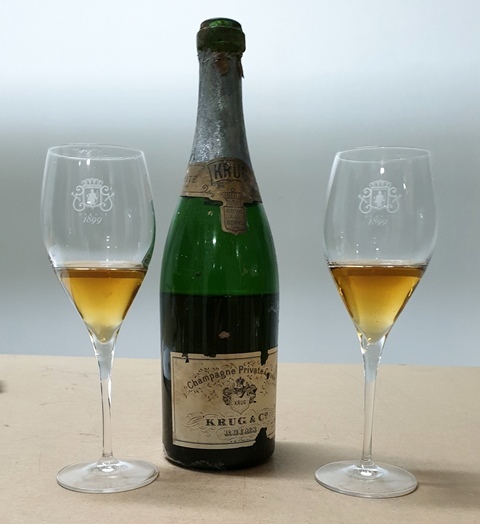 J’aimerais acquérir cette bouteille pour la boire et je propose à Tomo que nous l’achetions à deux pour la partager. Tomo avait lui aussi décidé de ne pas suivre l’offre pour lui-même et je lui propose l’acquisition commune, ce qui est quand même une folie. Nous décidons d’être fous. La bouteille est livrée par le marchand au restaurant Garance où nous dînerons, Tomo et moi. 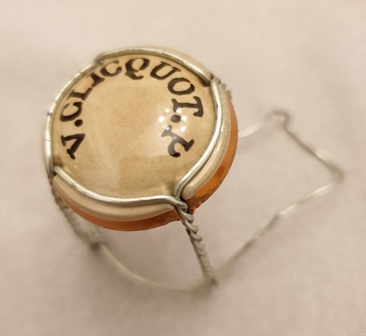 Tomo me propose d’ajouter un Montrachet et je lui propose d’ajouter un Musigny blanc. La cause est entendue et à 18 heures nous nous retrouvons au restaurant pour ouvrir les bouteilles. Les vins sont jeunes et l’ouverture ne cause aucun problème. 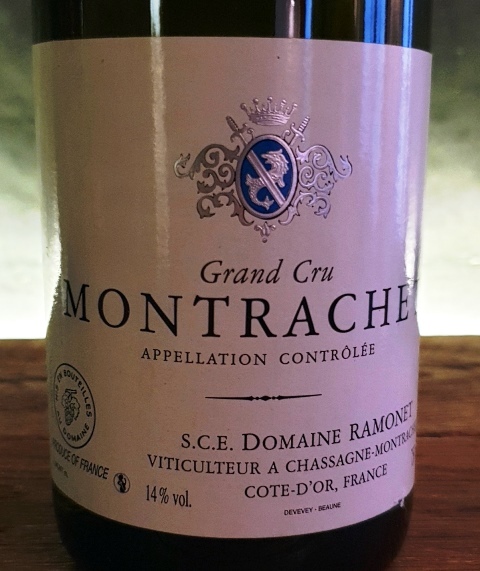 Le parfum du Montrachet Domaine Ramonet 2008 est une bombe de fragrances riches. 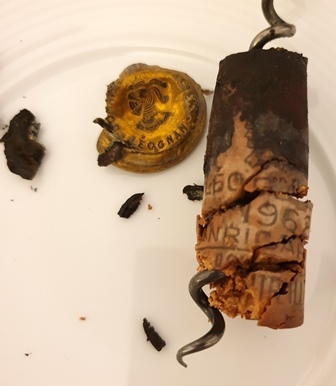 Ce vin explose de générosité. 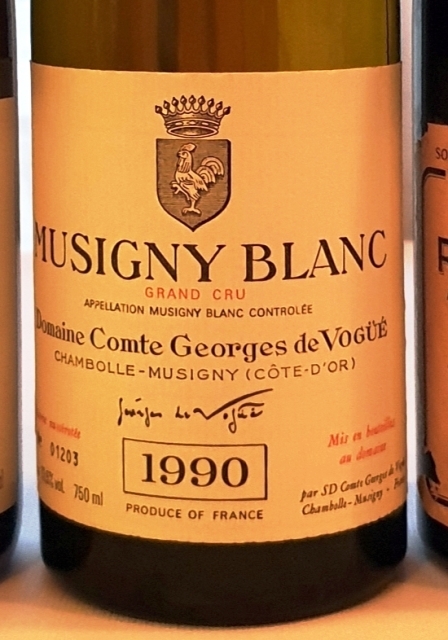 Le Musigny blanc Domaine Comte Georges de Vogüé 1990 a un parfum plus calme et plus intense. Il promet de belles choses. 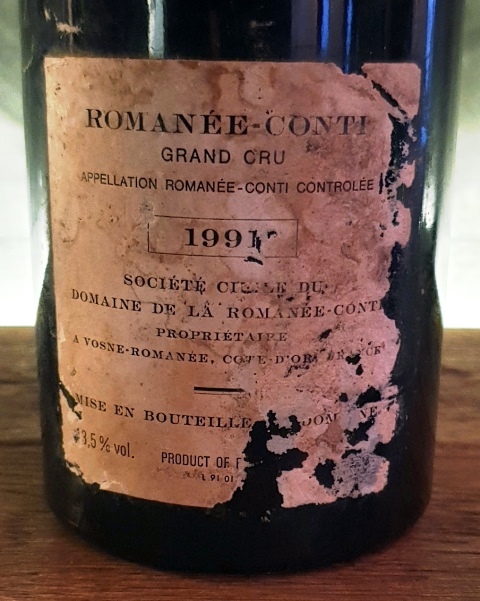 La Romanée-Conti Domaine de la Romanée-Conti 1991 a un parfum discret d’une belle noblesse. 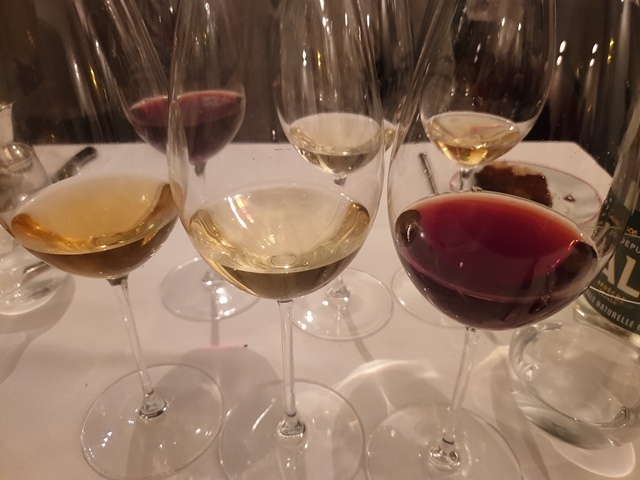 Les trois vins semblent conformes à ce que l’on peut en attendre. Tout va bien. Guillaume Muller directeur du restaurant nous propose des verres de Champagne Dhondt-Grellet extra brut sans année. 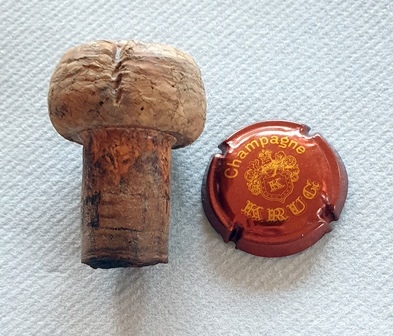 Ce champagne est une très heureuse surprise car il n’a pas le caractère parfois ingrat des champagnes ultra bruts. Il est très précis et bien fait. Je fais la connaissance de Alexis Bijaoui, le nouveau chef qui remplace Guillaume Iskandar. Il a 29 ans et a travaillé dernièrement à l’Arpège. Il est extrêmement sympathique. Nous avons le temps de préparer notre menu. Nous prendrons deux plats communs, le premier et le troisième, et nous différerons sur le choix du second. Mon menu sera : Saint-Jacques servies en coquilles, truffe noire et sauce au bois de genièvre / Carré de cochon, pressé de pomme de terre, mijoté et sabayon de noisette dont j’ai fait enlever l’oignon grillé / Canard gras boucané puis laqué, risotto de navet boule d’or et sarrasin, dont j’ai fait enlever la sauce aux algues. 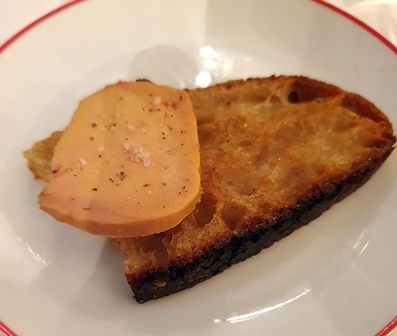 Avant le dîner Tomo a envie de goûter aux deux blancs et le chef nous prépare des toasts au foie gras dont le pain grillé est excellent, des brioches gourmandes et des petites tartes à la betterave. 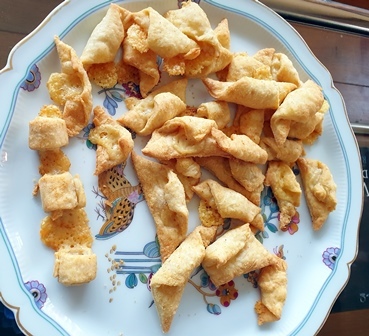 Ces petits grignotages d’apéritif montrent la belle sensibilité du chef. 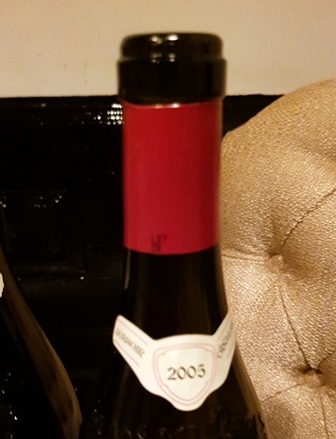 Le Montrachet Domaine Ramonet 2008 est toujours une bombe olfactive. 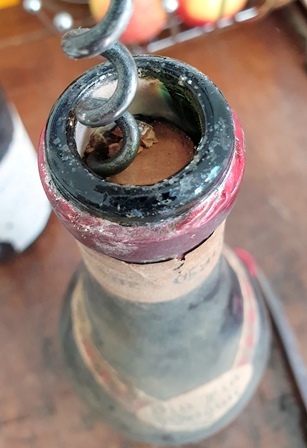 Il est si jeune qu’on le sent pétrolé, ce qui s’estompera avec l’élargissement du vin dans le verre. 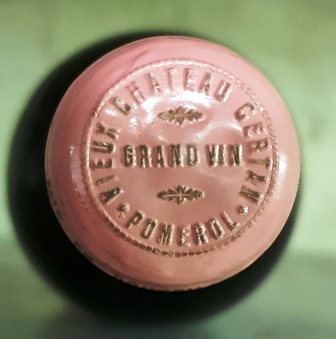 En bouche le vin est rond, généreux, plein et riche et a une joie de vivre communicative. 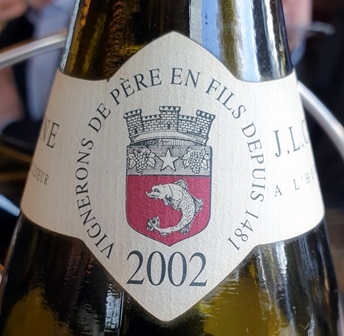 C’est vraiment un montrachet généreux comme certaines années du montrachet de la Romanée Conti dont il a la puissance. 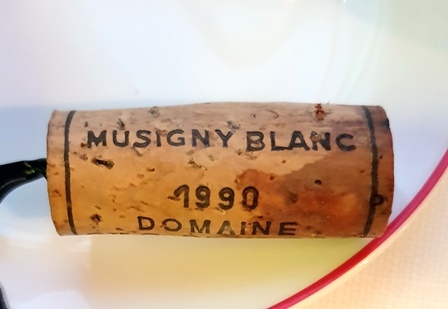 Le Musigny blanc Domaine Comte Georges de Vogüé 1990 a un nez racé et profond. En bouche ce qui frappe, c’est qu’il est incisif et tranchant, laissant une trace très longue en bouche. 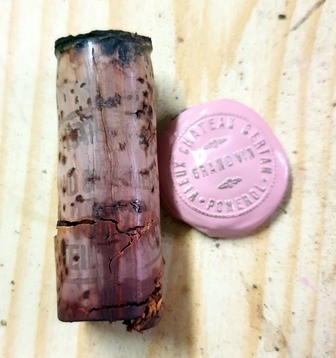 Il est profond quand le montrachet est rond. Ils sont extrêmement dissemblables. 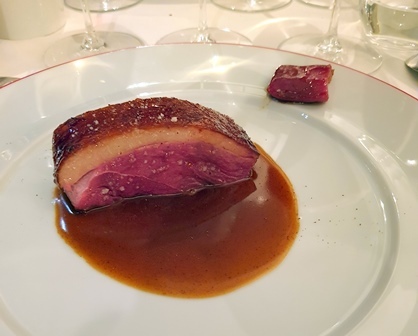 Du fait de l’âge, le Musigny est plus gastronomique et intéressant, mais le montrachet dans sa jeunesse est entraînant. 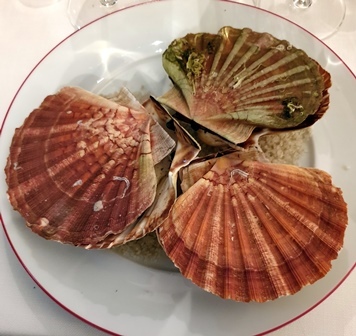 Tomo dit qu’il n’a jamais mangé d’aussi bonnes coquilles Saint-Jacques et c’est vrai qu’elles sont succulentes, presque crues, à peine cuites, de telle façon que la sucrosité de la coquille est encore présente. 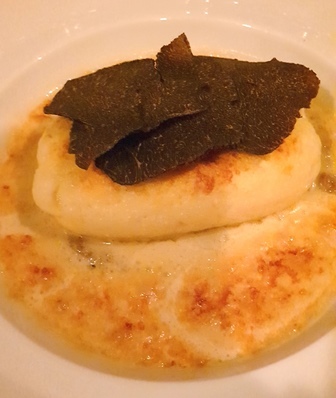 L’accord avec la truffe est pertinent et sur la coquille seule, le Montrachet est parfait. Sur la coquille associée à la truffe, c’est le Musigny qui est le plus pertinent. 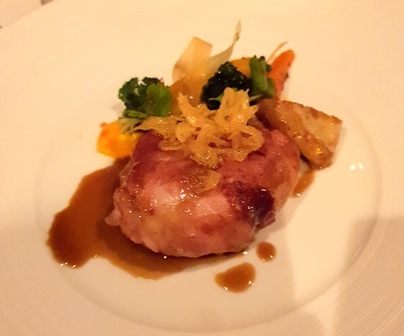 Le cochon et son gras généreux sont succulents. 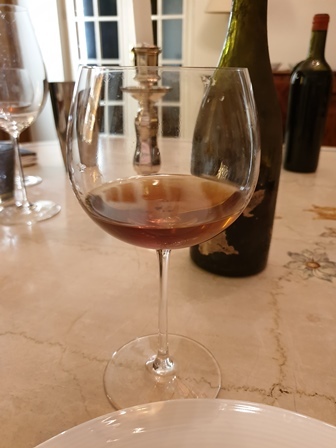 C’est le Musigny qui est le plus pertinent et la préparation des pommes de terre a un goût trop fort pour les vins qui demandent plus de douceur. 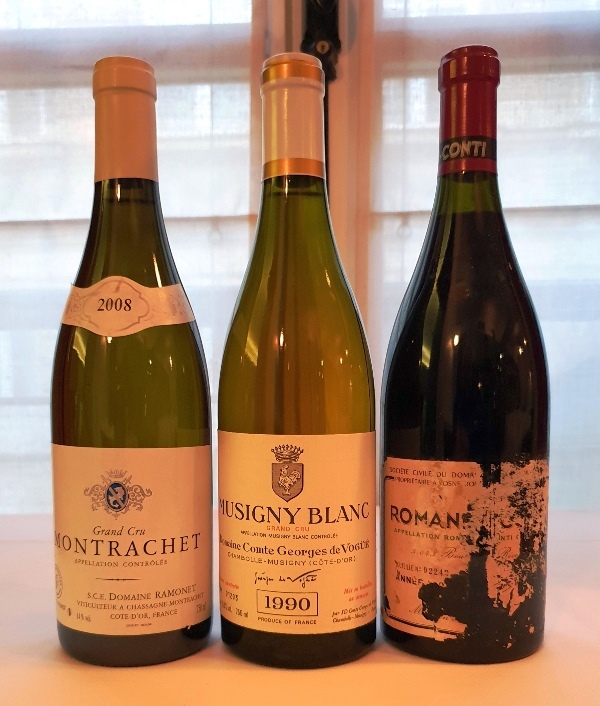 Nous nous régalons avec ces deux vins blancs si disparates qui s’épanouissent dans les verres, prenant plus de rondeur pour le Musigny et plus de maturité pour le montrachet. 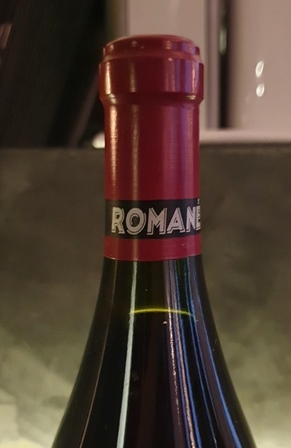 Tomo a tellement envie de goûter la Romanée Conti qu’il trépigne. Alors, bien que nos verres de blancs ne soient pas vides, nous passons à la découverte du rouge. 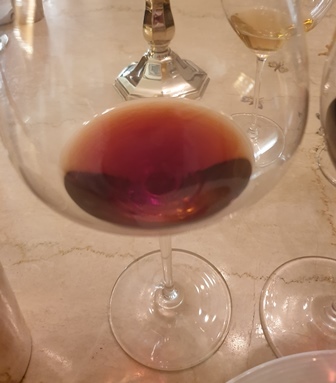 La Romanée-Conti Domaine de la Romanée-Conti 1991 a une couleur clairette pour le haut de la bouteille, toujours plus clair. Le niveau dans la bouteille était au plus haut possible, ce qui avait pesé dans ma volonté de l’acquérir. Le nez est tout en suggestion raffinée, c’est Aramis. En bouche le vin est d’une rare distinction. Alors on l’écoute. Et c’est un festival de madrigaux. Il raconte la carte du Tendre. 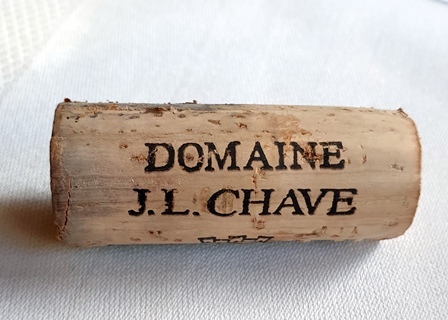 C’est, je pense, l’un des tout meilleurs des vins jeunes du domaine que j’ai eu la chance de boire. 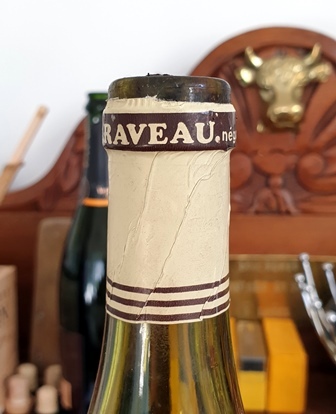 L’avantage de n’être que deux à boire une bouteille, c’est qu’on peut revenir sur le vin et l’écouter à l’infini. Le canard a une chair superbe. La sauce n’est pas adaptée au vin car elle est lourde. Il eût fallu une sauce au sang mais il faut bien dire que nous n’avions pas du tout préparé ce dîner. Sur la chair seule, la Romanée Conti est un roman d’amour, pianotant ses subtilités avec une grâce infinie. Quel bonheur ! 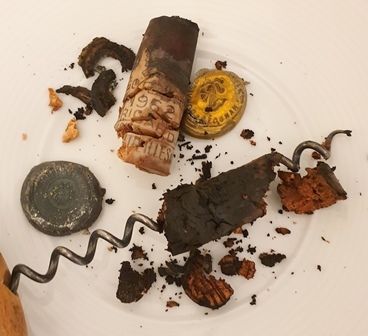 Le sel, marqueur habituel des Romanée Conti trouvant une résonnance particulière sur de fines tranches de navet cru, je demande que l’on me fasse une petite assiette de ces tranches crues pour titiller le vin rouge, mais on m’apporte des tranches de navet et de truffe imbibées d’une huile, ce qui rend l’accord impossible. Tant pis, ce n’est pas grave. Il reste dans les trois verres de quoi boire et l’expérience à laquelle nous allons nous livrer est intéressante. Un saint-nectaire est d’un affinage parfait. Il est délicieux et joue à la perfection le rôle de remise à zéro de nos palais. C’est incroyable. 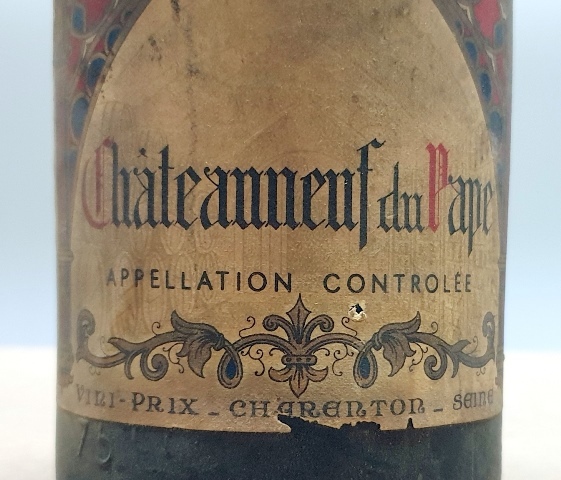 On boit un des vins blancs, on mange un peu de saint-nectaire et le palais est comme neuf et l’on peut passer au rouge et vice versa. 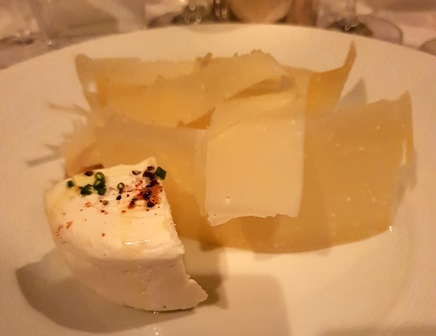 Jamais je n’aurais imaginé une telle efficacité du passage par la case fromage pour permettre de voyager entre les vins. 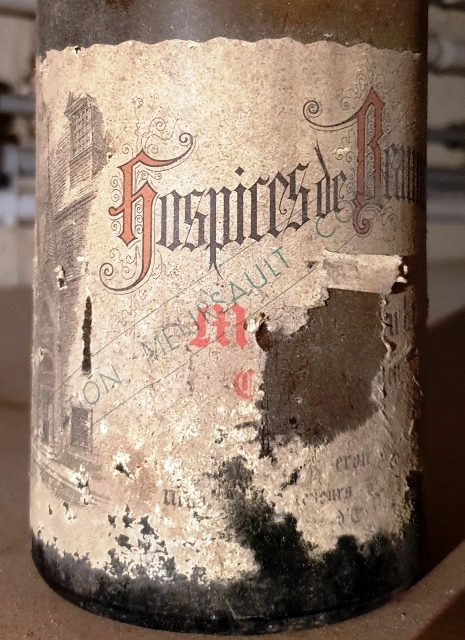 De ce voyage il apparaît que le Musigny est nettement plus complexe et profond que le montrachet alors que cette différence n’était pas aussi sensible en début de repas et la deuxième constatation est que la Romanée Conti est transcendantale par rapport aux deux vins blancs. 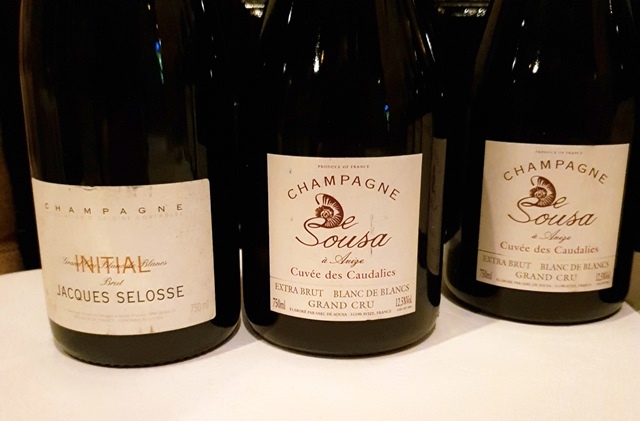 Des Romanée Conti comme celle–ci sont des moments de grâce absolue. 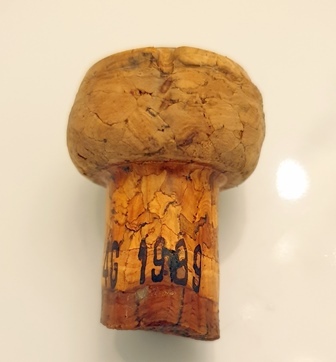 Le vendeur de cette bouteille, que nous connaissons bien avait apporté avec la bouteille une petite fiole annoncée comme contenant un Moscatel du 19ème siècle. Le liquide que nous buvons est d’une délicatesse infinie. 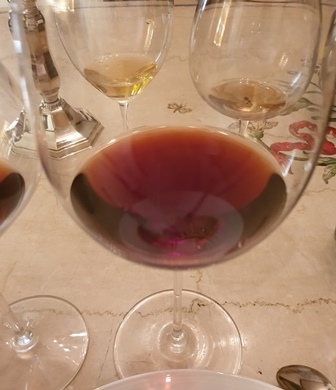 Il y a du gras, de l’onctuosité, mais il y a surtout une cohérence et un accomplissement qui n’appartiennent qu’aux vins doux de plus d’un siècle. Ce pourrait être de la région de Porto, mais je le verrais aussi bien de Madère. 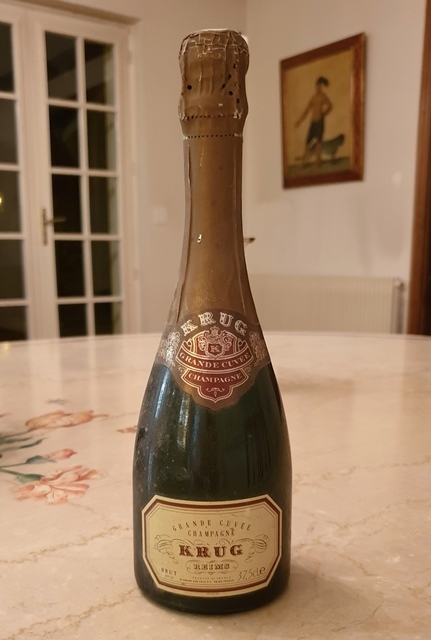 Ce fut un joli point final à un repas qui restera longtemps dans nos mémoires tant cette Romanée Conti fut belle. 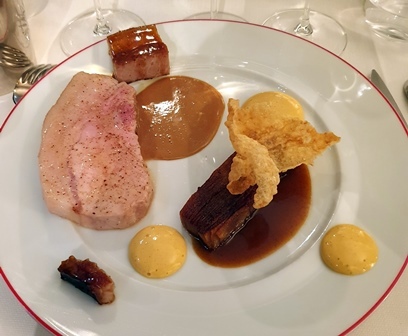 Guillaume Muller gère avec pertinence son restaurant et Alexis montre un grand talent dans les cuissons. On ne peut pas lui imputer les inadéquations passagères avec les vins, car nous n’avions rien préparé et demandé. A 29 ans Alexis apportera très vite une étoile au restaurant Garance. Alors, achetons vite des vins de folie ! Les jours se suivent et ne se ressemblent pas. Le réveil fut difficile et je décide que le nombre de vins pour notre déjeuner serait réduit. 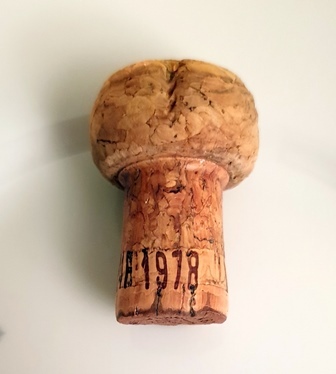 Le Veuve Clicquot 1899 en demi-bouteille de Florent et le Heidsieck Monopole sec 1904 en demi-bouteille de ma cave ne seront pas bus ainsi que le Meursault Goutte d’Or Morin Père et Fils 1949 de Florent et le vin allemand du début du 20ème siècle au nom illisible. Il n’y aura que les bouteilles ouvertes hier qui figureront au déjeuner. 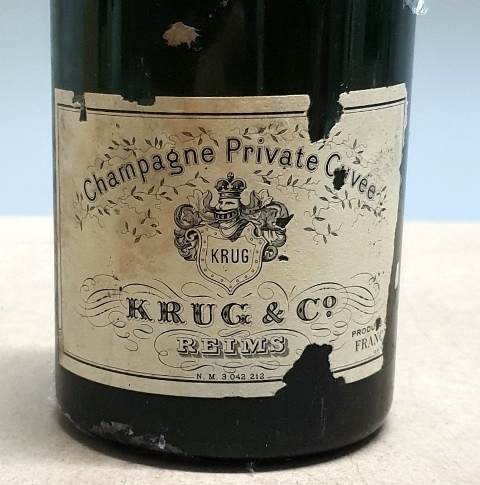 La table est mise dans ma cave et sur le reste du Champagne Krug Private Cuvée années 40, nous goûtons un camembert excellent. 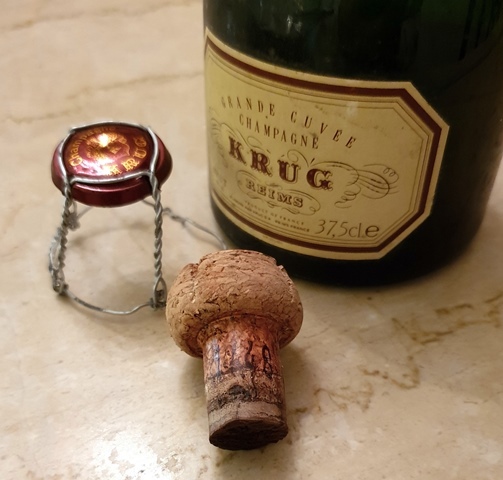 Le champagne a profité de la nuit et s’est ouvert, avec une joie de vivre plus grande, même si les bulles sont plus rares. 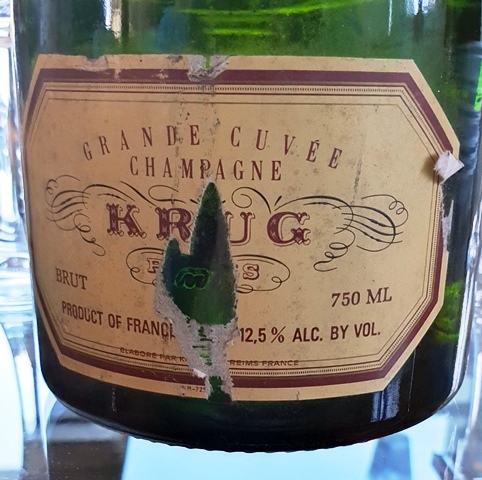 Ce champagne est devenu très agréable, même s’il n’a pas vraiment un goût de revenez-y. J’avais ouvert hier un supposé Château Margaux vers 1910 au parfum incertain. 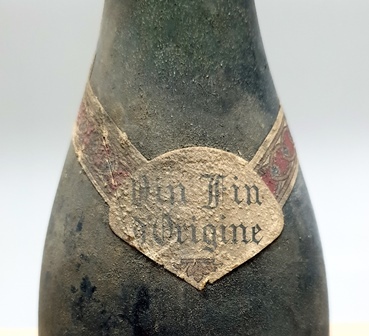 Aujourd’hui, les miracles ne sont pas à l’affiche, car le vin dévié ne paraît pas buvable et ne reviendra jamais à la vie puisqu’il ne s’est pas ouvert en une vingtaine d’heures. Le Meursault inconnu d’une cave de restaurant années 40 a passé une mauvaise nuit car il a perdu son équilibre et n’incite pas à le boire à nouveau. Il a eu son heure de gloire hier. La bouteille que j’avais rangée loin des autres hier à cause de son odeur désagréable se refuse elle aussi. L’odeur s’est vinaigrée et l’acidité épouvantable empêche de la boire. C’est une journée sans miracle. 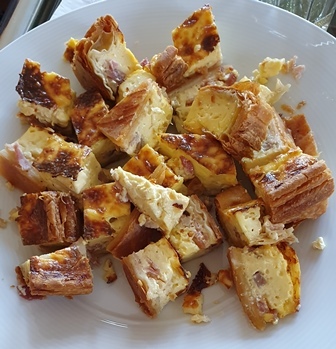 Sur le champagne nous mangeons des tranches de saucisson et un joli jambon de Parme. Le rôti de porc froid et les fromages vont accompagner les deux 1915. Le Corton Geisweiler 1915 de Florent a une très belle couleur fraîche et claire. Le nez est raffiné, peu expansif. En bouche, il est très sauvage, atypique, avec une fraîcheur inattendue. Il a du volume et une belle expression. 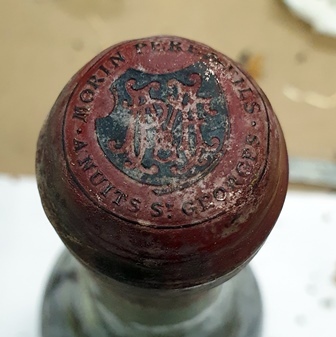 Le Nuits-Saint-Georges Les Cailles Morin Père & Fils 1915 de ma cave qui avait un superbe bouchon à l’ouverture a une couleur plus foncée que celle du corton. Le nez est profond, intense, ce que l’on retrouve dans le goût puissant. 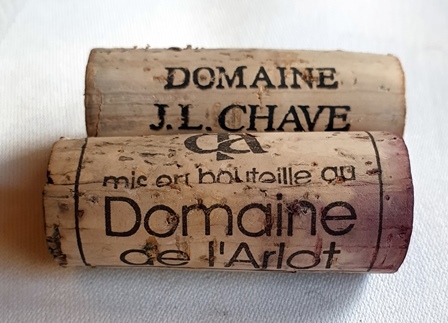 Les deux vins nous offrent ce qui se fait de mieux dans les Côtes de Beaune et dans les Côtes de Nuits pour cette période. 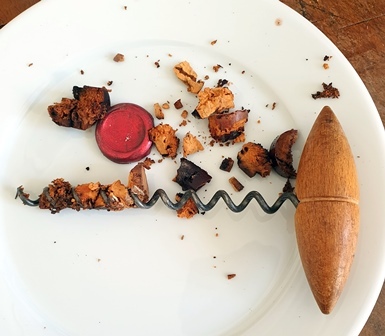 Ils sont très dissemblables et ce qui est amusant c’est qu’au début de la dégustation, Florent préfère mon vin et je préfère le sien alors que généralement, il est naturel, surtout pour moi, de préférer son propre apport. 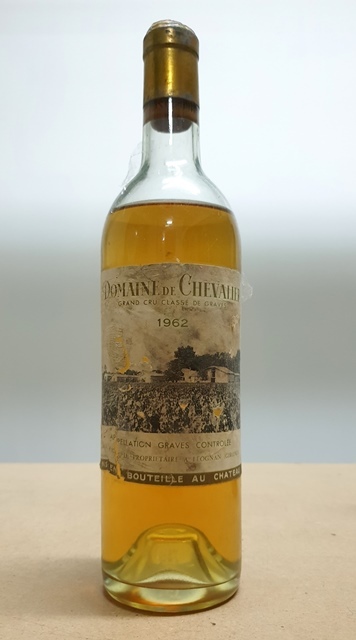 Nous différons aussi sur l’appréciation du fruit dans les deux vins. Florent trouve le Nuits plus fruité et je trouve le corton plus fruité. 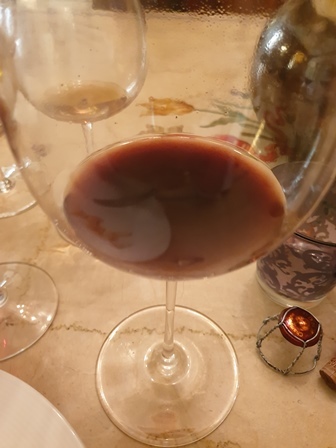 Nous nous retrouvons tous les deux sur le fait que les deux vins sont exceptionnels et que leurs 103 ans ne correspondent à aucun affaiblissement de leurs qualités. Ils ont puissance et énergie sans aucun bémol. Le Nuits se montre plus grand que le Corton et Florent qui aime les notations donne un écart de 4 points sur 100 en faveur du Nuits. Il est à noter aussi que c’est la douzième fois que je bois le Nuits 1915 (j’en ai bu un ou deux avant de créer les bulletins) et aucun n’a été autre chose que parfait. Ce lot de vins extrêmement sain est incroyable. Mis sept fois dans des dîners où l’on a voté il a été nommé cinq fois premier ou second par le consensus. Le corton est plus frais, plus aérien au final de jolis fruits rouges. Le Nuits est plus riche et plus profond, incisif et bourguignon sans concession. 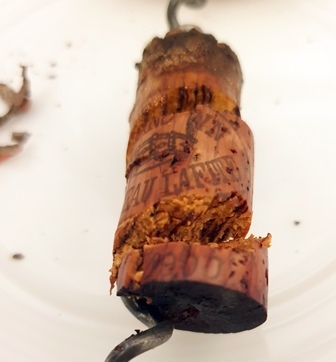 Je pense volontiers que le grand vin est éternel et que sa mort n’est causée que par la mort du bouchon. 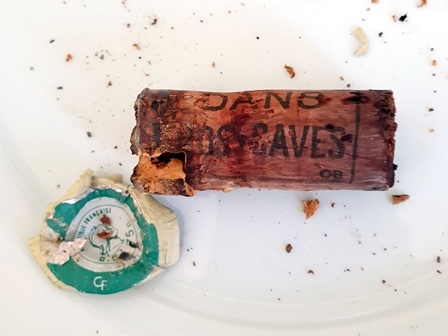 Nous avons la preuve qu’avec deux bourgognes de 103 ans dont le bouchon est venu entièrement sain, il n’y a aucune trace de vieillissement mais des évolutions vers des saveurs plus abouties et intégrées. Florent va reprendre son train. 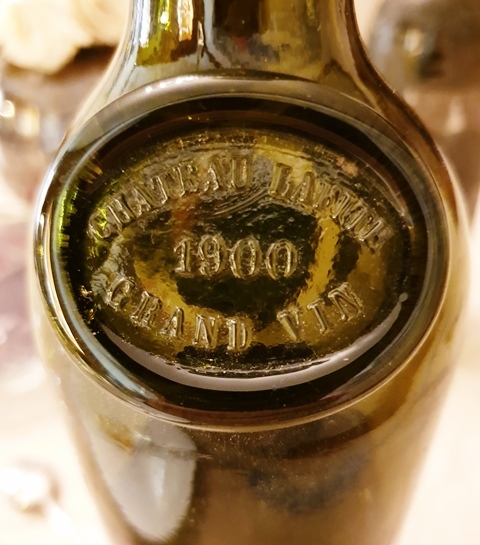 Lafite 1900, Nuits Cailles 1915 et Corton 1915 ont fait de ces deux jours d’amitié un moment exceptionnel. 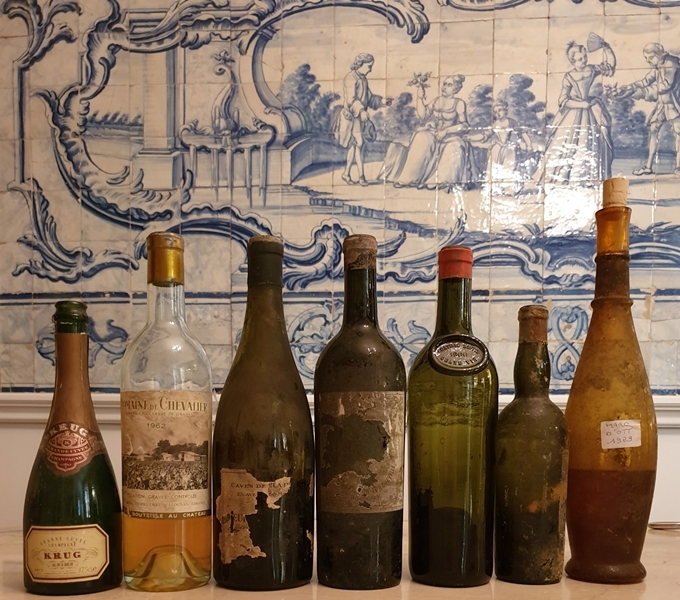 1/2 Krug Grande Cuvée, Domaine de Chevalier 1962, Meursault années 40, Pichon 1904, Pétrus 1900, Pedro Ximenez, Marc de rosé d’Ott 1929. Belle brochette ! 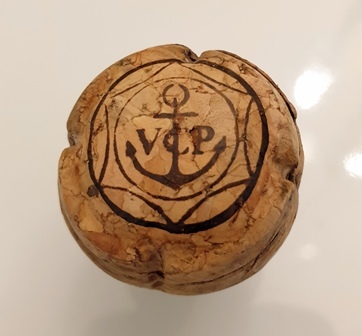 Parce que nous atteignons un âge qui représente trois quarts de siècle, notre groupe de conscrits décide que cela mérite un dîner, en plus de nos périodiques déjeuners au Yacht Club de France. Le choix se porte sur le Relais Louis XIII de Manuel Martinez, ex chef de la Tour d’Argent et MOF 1986. 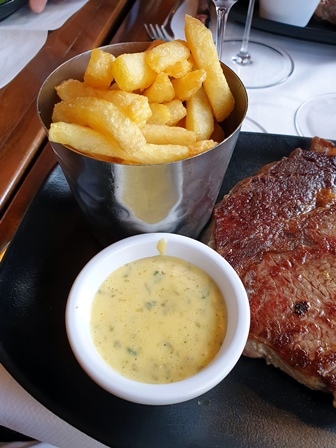 Nous sommes accueillis par sa charmante compagne qui nous dira lors de la composition de notre menu, que chaque plat choisi est le meilleur de Paris, voire de France, voire du Monde. J’ai la charge de suggérer les vins, mais sous haute surveillance de mes conscrits. Nous prenons un champagne d’attente car un des amis a eu une panne sur sa voiture et ne viendra que plus tard. 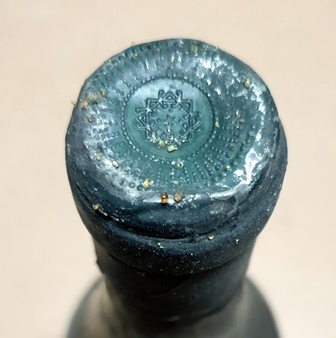 C’est le Champagne Initial de Selosse dégorgé en décembre 2010. 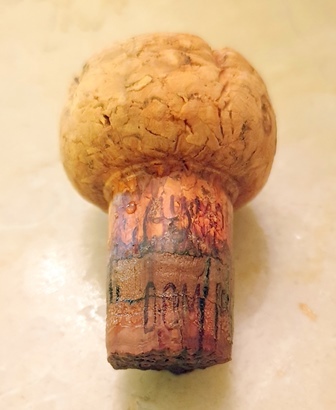 J’ai prévenu mes amis du fait que c’est un champagne atypique et il l’est. Il combine un caractère vineux avec des évocations de fruits roses un peu compotés. 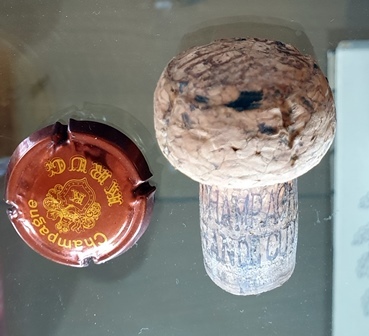 Dans les très efficaces verres conçus par Philippe Jamesse, l’ancien et célèbre sommelier des Crayères à Reims, le champagne s’élargit et devient de plus en plus charmant, le vineux étant compensé par une belle douceur. Mes amis l’apprécient. 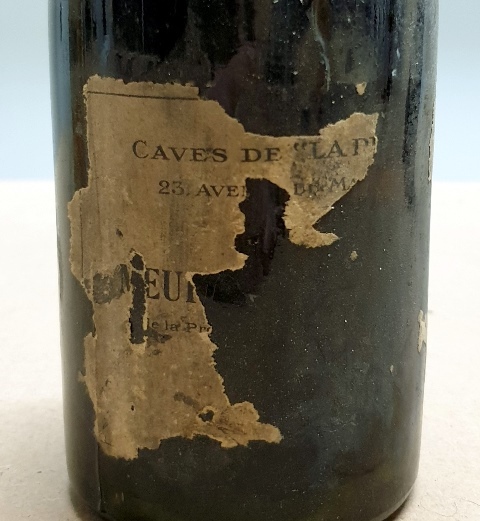 Nous changeons de style avec le Champagne de Souza Cuvée des Caudalies extra brut blanc de blancs sans année. 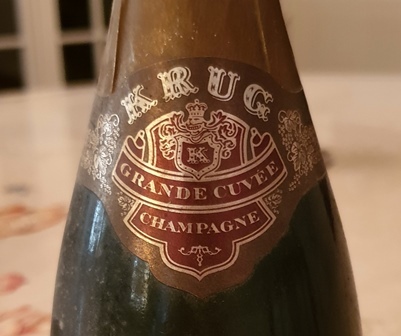 Ce champagne est d’une grande pureté. Il est précis, franc et a toutes les qualités des chardonnays d’Avize. Il est élégant et appréciable aussi nous en reprenons un pour accueillir notre ami en panne de voiture. 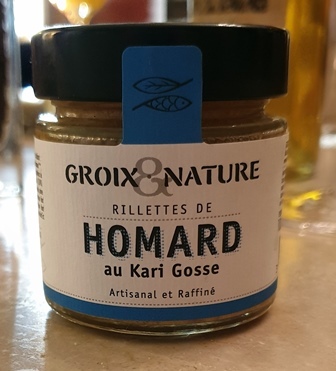 Les petites choses à grignoter sont exquises, dont un pâté en croûte particulièrement bon. 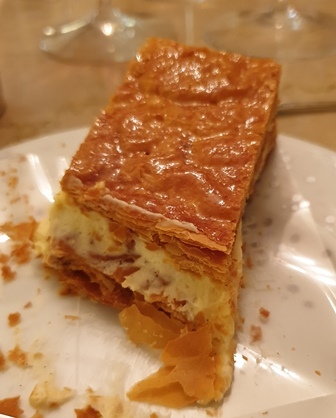 Mon choix de plat sera : quenelle de bar abondamment couverte de truffe / ris de veau / comté trente mois / millefeuille. 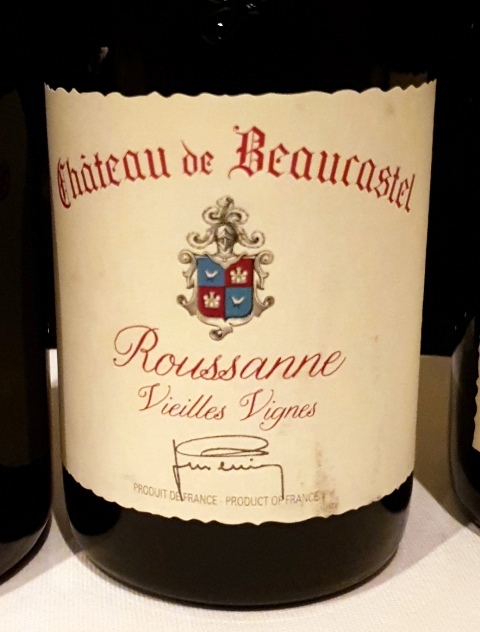 Le Château de Beaucastel Roussanne Vieilles Vignes Châteauneuf-du-Pape 2015 est tonitruant. 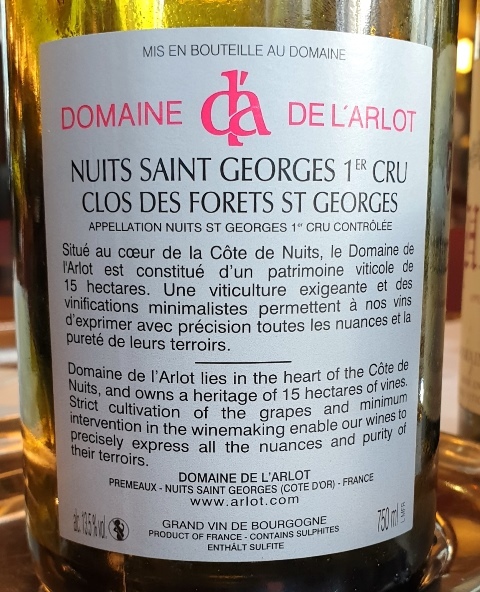 Son nez est incroyable de puissance, comme celui d’un Montrachet qui aurait connu du botrytis. 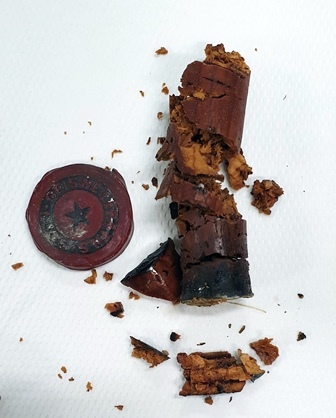 Les vieilles vignes se sentent dans le caractère fumé du vin. 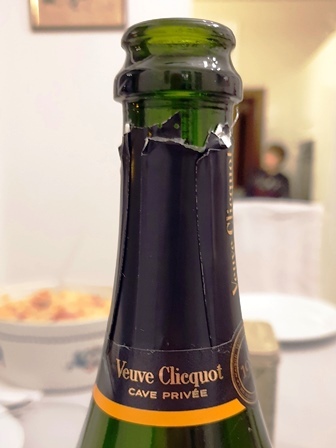 Ce vin est impérial. La quenelle est la plus exquise que Dieu ait donnée. Elle est gourmande et l’accord est idéal. La deuxième bouteille a un peu moins d’énergie que la première. 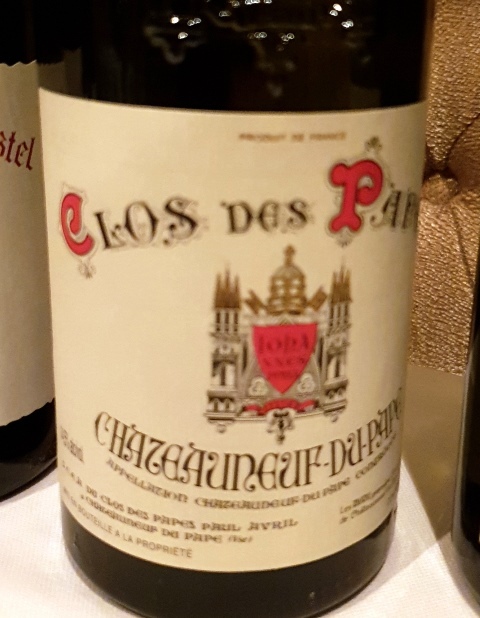 Pour le ris de veau qui est magnifiquement bien traité Nous buvons le Châteauneuf-du-Pape Clos des Papes 2005. Le vin est puissant, riche, entraînant. Il est facile à vivre car il est direct et compréhensible. La deuxième bouteille sera nettement meilleure que la première, avec plus de pureté et de précision. 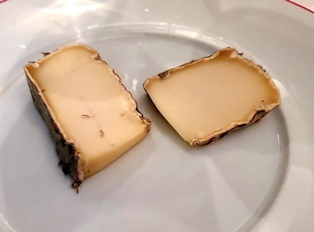 Le comté trente mois découpé en fines lamelles est parfait. 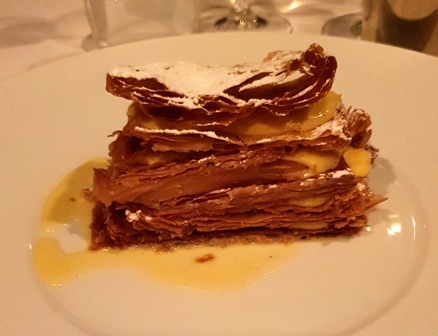 Le millefeuille est d’une légèreté incroyable. 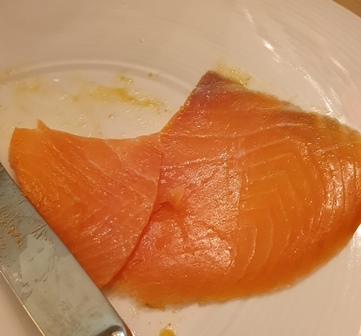 Il n’est peut-être pas le meilleur du Monde, qui sait, mais il nous ravit tant on le mange avec bon cœur, après tant de richesse dans les plats précédents. 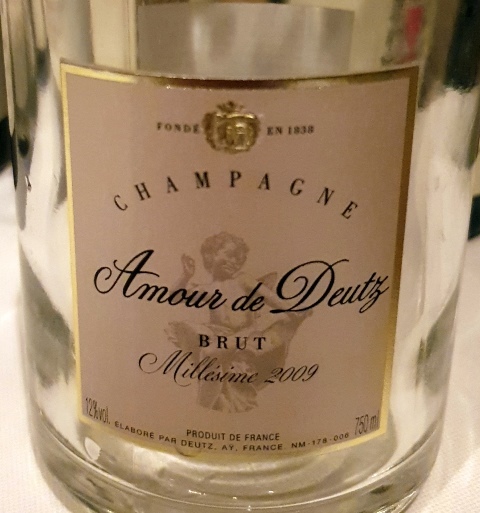 Sur le dessert nous buvons le Champagne Amour de Deutz Brut 2009 qui est fort agréable même si l’accord avec la vanille n’est pas spontané. Le restaurant a une décoration avec des boiseries anciennes et des tableaux résolument modernes. Dans la petite salle qui nous a été réservée, les deux tableaux de Combas ne plaisent pas à plusieurs amis. Des goûts et des couleurs … La femme du chef est dynamique et joyeuse, et vendrait du pain à un boulanger ! J’ai pu bavarder avec le chef sur des souvenirs communs. 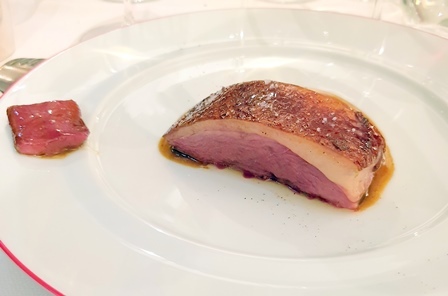 On se sent bien dans ce restaurant rassurant, à la cuisine traditionnelle généreuse mais tellement bien exécutée. 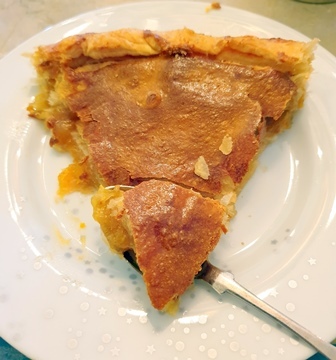 Champion du monde, dirais-je pour faire plaisir à notre hôtesse. La carte des vins est de belle variété et les prix sont très acceptables tant qu’on ne va pas sur le terrain des vins recherchés par des amateurs étrangers. 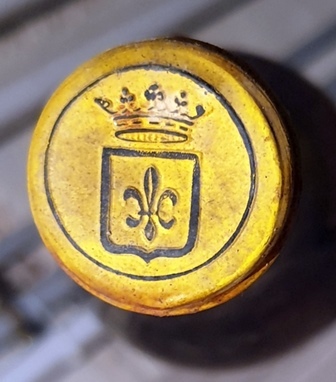 Lorsque j’avais discuté avec Yannick Alléno lors du dîner à Kaviari, il m’avait vanté les qualités du relais Louis XIII. Il avait bien raison, cette table mérite qu’on s’y rende au plus vite. Cette entrée a été publiée dans dîners ou repas privés le 25 janvier 2019 par François Audouze. Le repas du dimanche midi réunit mes deux filles et trois des quatre petits-enfants. 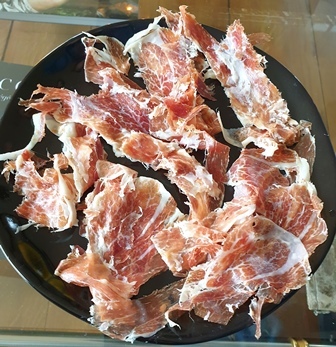 A l’apéritif il y aura des petits fours préparés par une des petites-filles et du jambon Pata Negra. 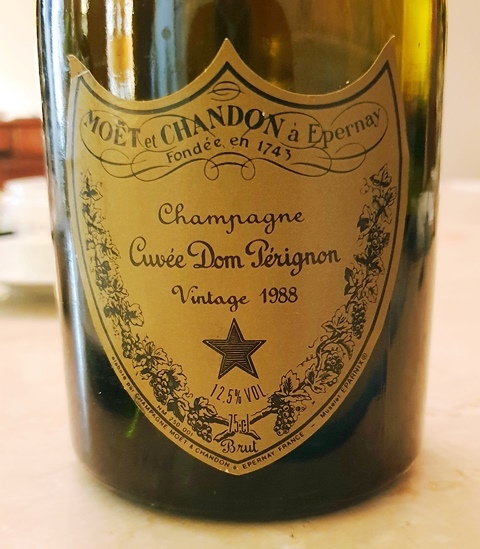 Je sers le Champagne Dom Pérignon 1988 que nous avions ouvert il y a deux jours et dont le défaut de bouchon avait disparu très rapidement. Qu’en est-il aujourd’hui ? La surprise est belle. 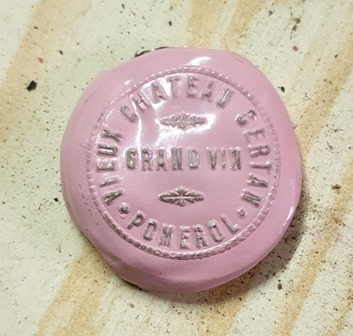 La couleur est joliment ambrée comme l’autre jour, la bulle est beaucoup plus rare mais le goût est particulièrement bon. Il y a des fruits dorés de miel mais aussi des suggestions de fruits rouges et le tout combine charme romantique avec un message virilement affiché. Ce champagne est grand. Je n’en attendais pas autant. 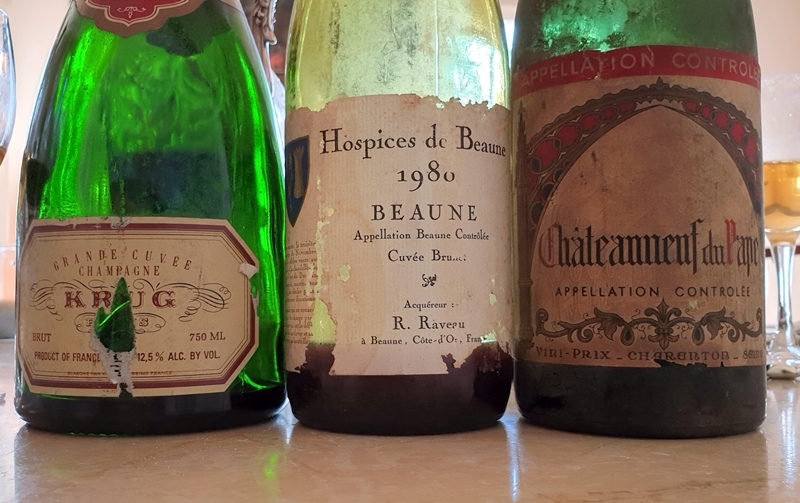 Ma femme ayant annoncé des harengs marinés au curry et d’autres à la moutarde, le choix d’un vin était délicat aussi ai-je ouvert un Meursault Charmes Hospice de Beaune 1960 dont le vigneron est illisible. Je l’ai choisi en cave car la couleur est très claire, à travers la bouteille, et le niveau est parfait. A l’ouverture, dès que j’ai voulu piquer le bouchon avec la pointe du tirebouchon, il est immédiatement tombé dans la bouteille. 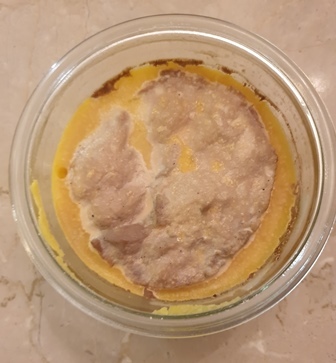 J’ai rapidement carafé, mais un petit morceau du bas du goulot est tombé dans la carafe. Allait-il souiller le liquide ? Fort heureusement non. 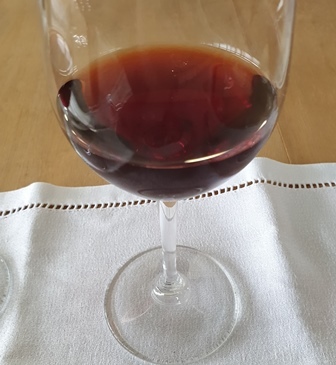 La couleur du vin est plus ambrée dans le verre que dans la bouteille et elle est jolie. Le nez est très pur et le liquide est bien intact. 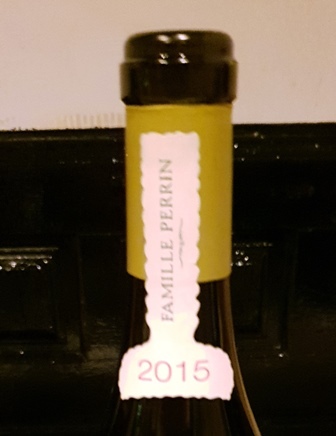 C’est un parfum très précis, de belle personnalité, qui annonce un vin de qualité. 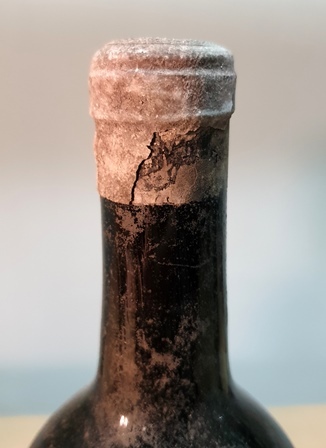 En bouche il y a une acidité très présente, ce qui va permettre au vin de se comporter très pertinemment avec les harengs aux goûts très forts. Après avoir mangé du hareng et apaisé son palais, on constate que l’acidité s’est apaisée et le meursault devient riche et élégant. 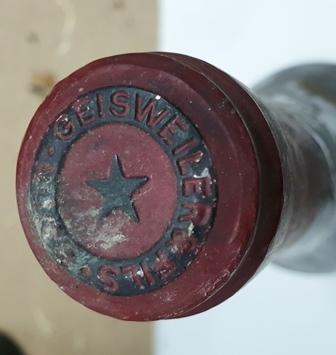 C’est un vin fort agréable et qui tient bien sa place rafraîchissante et de belle longueur linéaire (on peut penser qu’une longueur serait linéaire, mais il arrive avec certains vins qu’elle fasse l’école buissonnière). Ce n’est pas le cas pour ce joli meursault. 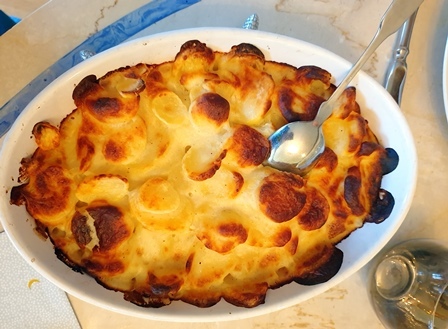 Le plat principal est un agneau fourré avec un ail très présent, cuit à basse température, et un gratin dauphinois et des petits légumes. 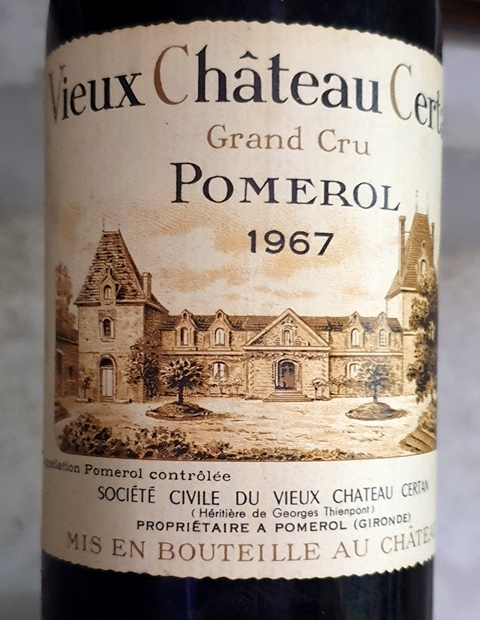 Le Vieux Château Certan Pomerol 1967 était emballé dans un fin papier bleu gris très foncé ce qui fait que l’étiquette est comme neuve. Le niveau est dans le goulot, sans la moindre perte de liquide. Le bouchon vient comme il faut même s’il se fend un peu et en le levant, je pensais que bouchon est neutre, ce qui n’est pas normal, mais en fait les impressions sont conformes et se sont affadies. 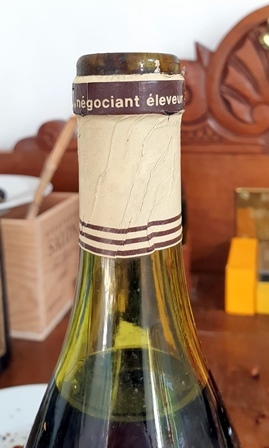 A l’ouverture le nez était exceptionnel, promettant un vin de très haut niveau. Au service, le nez est impérial et impérieux. 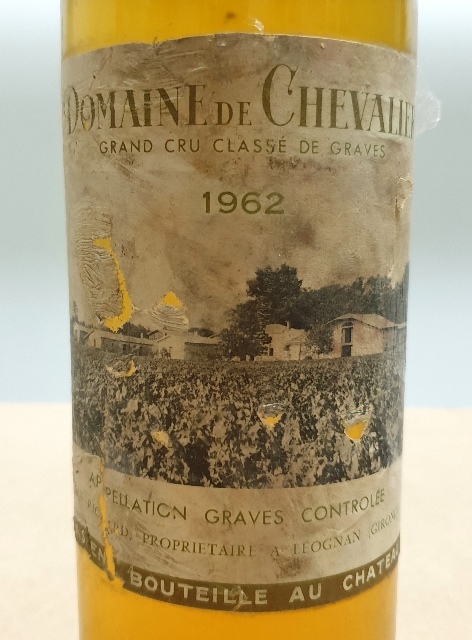 C’est un très grand vin. 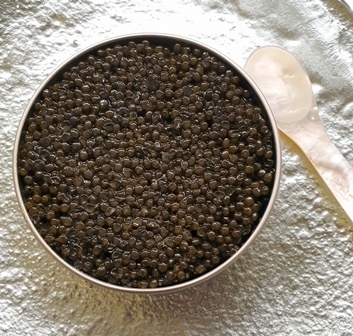 En bouche il est noble et ample, large, insistant, avec des notes de belles truffes. 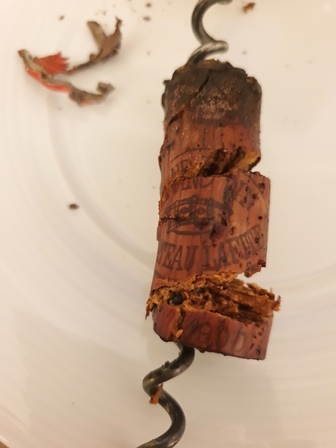 Mes filles se rendent compte qu’elles sont en face d’un vin qui a atteint un niveau de perfection rare. L’accord avec le plat est naturel. 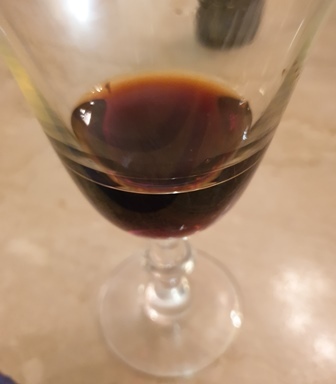 Pour la galette des rois qui nomme roi mon petit-fils, je sers le Xérès La Merced Solera Sherry semi-dulce Bobadilla probablement des années 60 que j’avais ouvert à Noël et qui n’a pas perdu la moindre parcelle de son charme doucereux. Ce repas a été illuminé par un Vieux Château Certan 1967 de très haut niveau. Cette entrée a été publiée dans dîners ou repas privés le 22 janvier 2019 par François Audouze. Une de mes petites-filles est seule avec ses grands-parents. 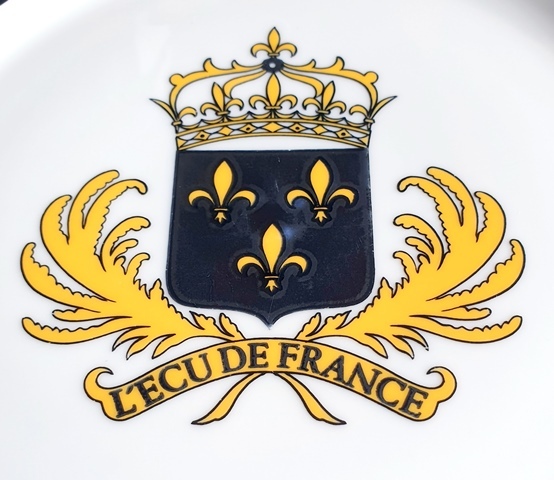 Ma femme souhaite qu’elle découvre le restaurant l’Ecu de France, ce relais de poste à la décoration aux fleurs de lys et chargée d’histoire. Les repas cette semaine ont été tellement nombreux que je décide de ne pas boire, malgré l’intérêt de la carte des vins. Je vais saluer Peter Delaboss, le souriant chef d’origine haïtienne. J’adore l’exubérance que l’on sent dans ses plats. 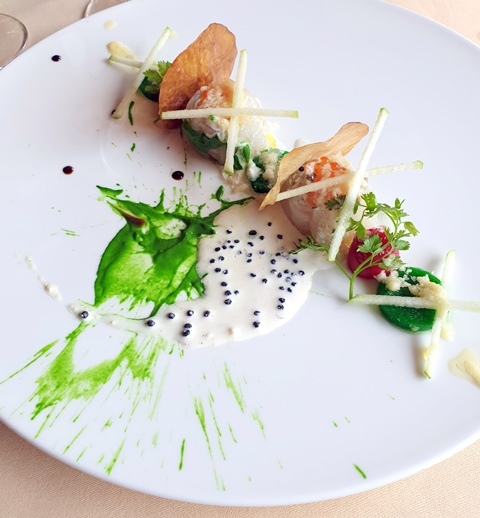 L’amuse-bouche est un essai du chef à base de daurade crue, d’huître et de mille autres saveurs savamment jetées sur l’assiette. Il y a du peintre Matthieu dans sa création dynamique. 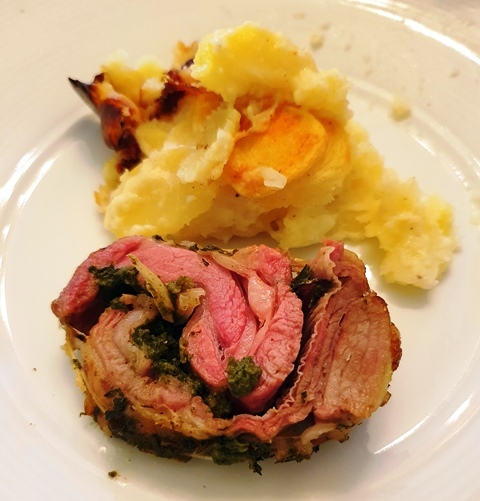 C’est ce plat que ma femme préférera. 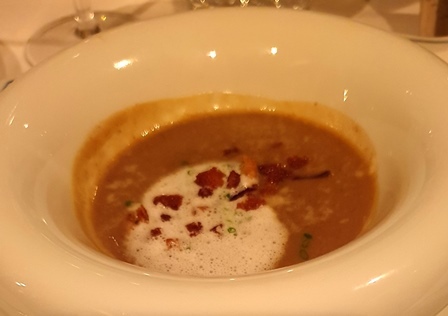 L’entrée est une soupe à l’oignon revisitée, avec de magnifiques coquilles Saint-Jacques. 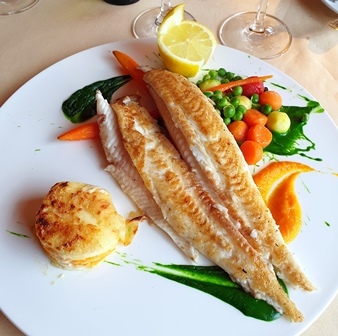 Le plat principal est pour chacun une sole de grande taille préparée de façon classique. 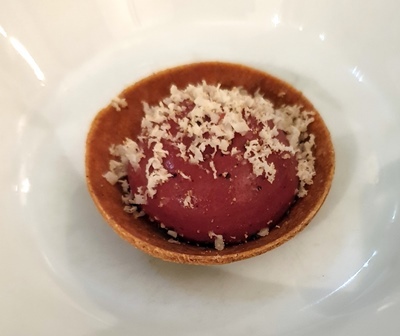 Sagement nous n’avons pas pris de dessert car la cuisine du chef est généreuse. En partant nous avons bavardé avec les propriétaires, la famille Brousse, père, mère et fils, et avec Peter toujours aussi souriant et inventif qui rêve en permanence à de nouvelles recettes. L’Ecu de France est un lieu où nous nous sentons bien. Mon fils et une de mes filles dînent à la maison. 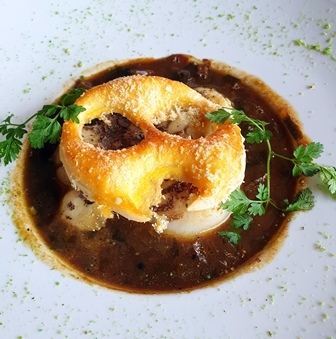 Le programme est de différentes préparations de harengs, au curry, à la moutarde et à la crème qui ne sont pas des amis naturels des vins. 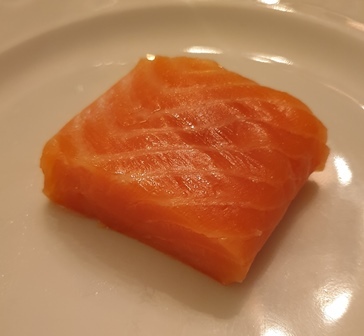 Il y aura ensuite un cœur de saumon fumé et du caviar osciètre que ma femme a achetés avant notre dîner à la Manufacture Kaviari. 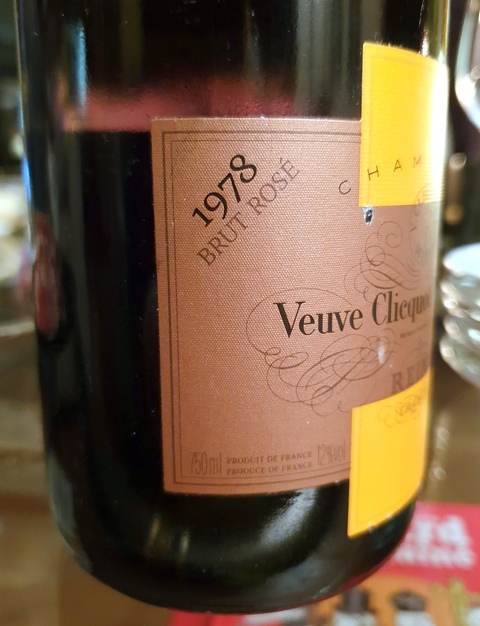 J’ouvre un Champagne Veuve Clicquot Ponsardin rosé Brut Cave Privée 1978 dont la couleur rose est très prononcée. Ce rosé a une très belle personnalité. Il s’impose, carré, solide et percutant. Il accompagne à l’apéritif un tarama à l’oursin et l’accord se trouve bien. 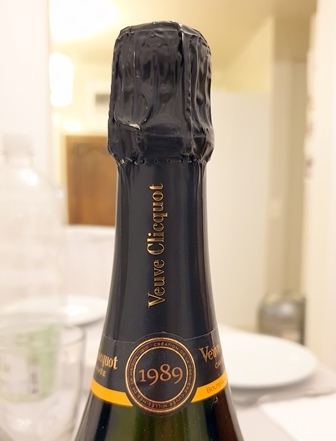 Avec les harengs, si l’on prend soin de calmer son palais avant de boire, on s’aperçoit que le champagne donne beaucoup de plaisir. C’est un rosé plus solide que charmeur. Il est grand. 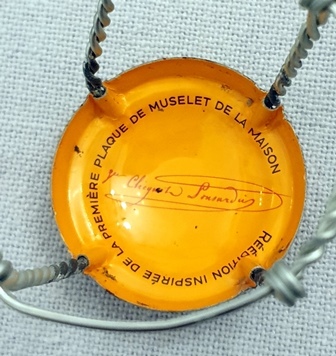 Pour le caviar, un choix naturel est un Champagne Dom Pérignon 1988. 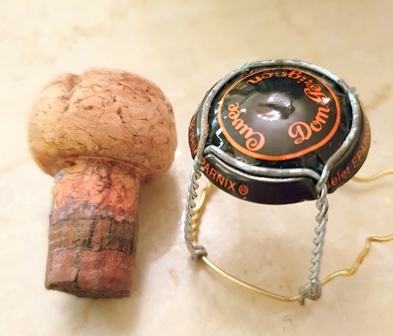 Le nez du champagne est bouchonné, ce qui n’arrive quasiment jamais, et la bouche est aussi marquée par le bouchon, mais sans que ce soit rebutant. Le bouchon ne sent pas le bouchon, ce qui donne une lueur d’espoir. En une dizaine de minutes le parfum et le goût n’ont plus la moindre trace de bouchon. Alors, peut-on dire qu’il s’agissait de bouchon, qui est généralement un défaut très tenace ? 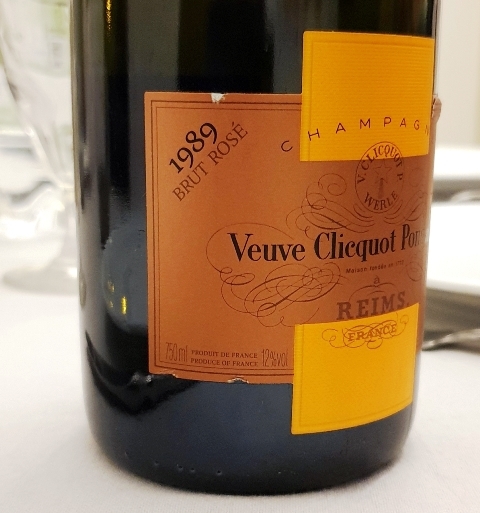 Le champagne devient agréable sans être transcendant, alors que son année est l’une des plus belles. J’ai rapporté pour ma fille, mais aussi pour nous quelques fonds de bouteilles. 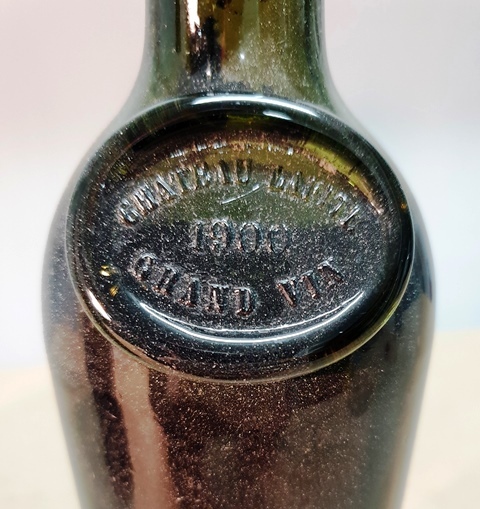 Il y a le Vin de Chypre 1870 d’un précédent dîner, large, puissant, à la belle acidité et au poivre affirmé. 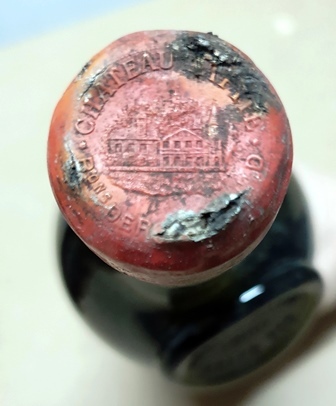 Après lui, ce sont les restes du Marsala 1872 qui avait été servi aussi au château d’Yquem. Il est tout en douceur et évoque des fruits légers et variés. J’adore sa complexité car il est insaisissable. Il me plait beaucoup par la diversité de ses fruits suggérés. 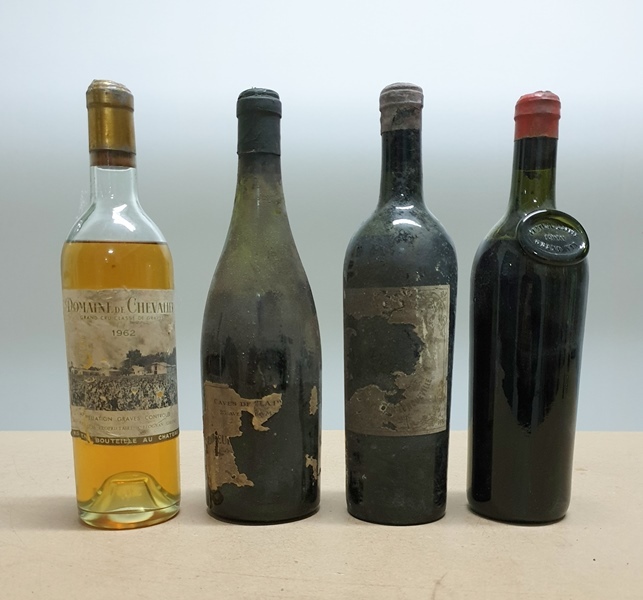 Il restait beaucoup du Marc de rosé d’Ott 1929 qui se montre différent de ce qu’il avait montré à Rhône Vignobles et au Taillevent. Il paraît plus fort, plus marc avec beaucoup de charme. Lorsque les trois petits verres sont vides, on remarque à quel point les parfums de ces trois alcools sont forts, entêtants et vraiment différents. C’est très difficile de les hiérarchiser car le Malaga 1872 est le plus discret mais subtil. C’est sans doute le Chypre 1870 qui est le plus glorieux. 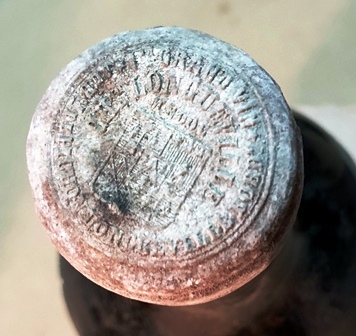 Ces vins doux et alcools très anciens sont fascinants. Cette entrée a été publiée dans dîners ou repas privés le 19 janvier 2019 par François Audouze. 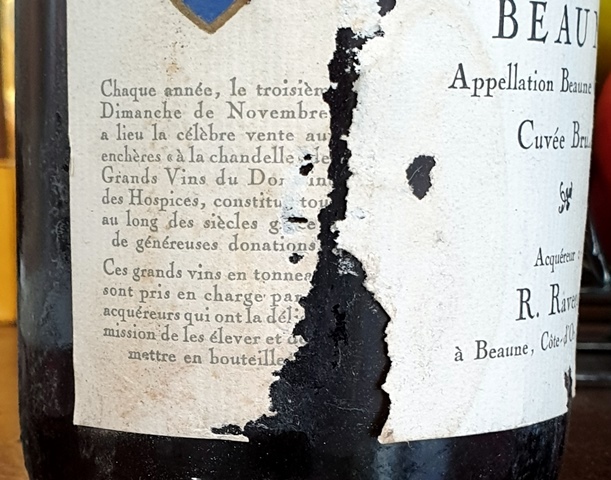 Au dîner au château de Beaune qui précède la vente des Hospices de Beaune, j’avais rencontré un amateur de vin qui souhaitait que nous puissions continuer nos discussions autour du vin. Il suggère un déjeuner avec l’un de ses amis qui a eu un parcours professionnel ayant des étapes similaires aux miennes. 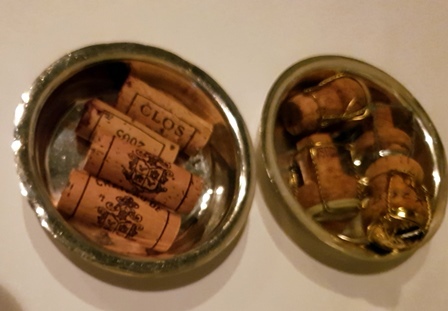 Nous discutons du lieu et je propose le restaurant Le Petit Sommelier qui a l’une des plus belles cartes de vins de Paris. Etant en avance j’ai le temps de consulter la carte des vins et le nombre de bonnes pioches est très important. 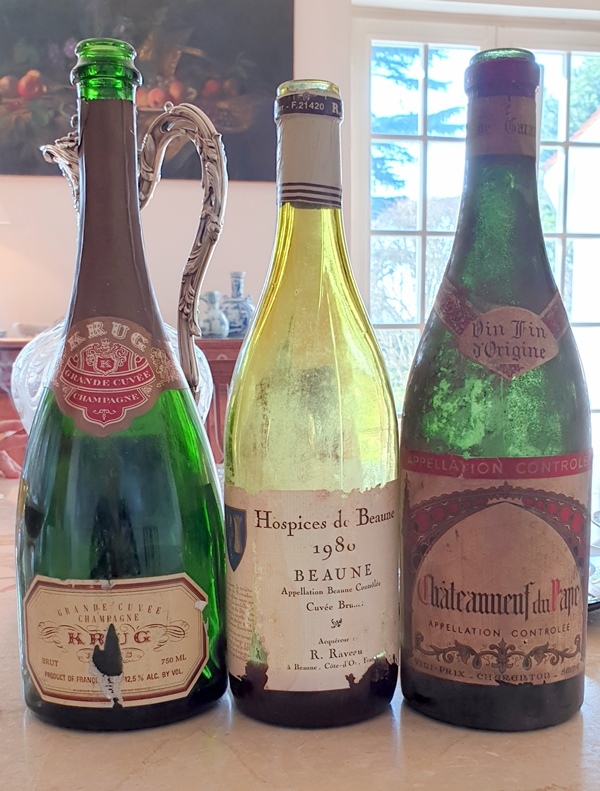 Nous discutons à trois et l’accord se fait très vite sur deux vins. Nous choisissons nos plats. 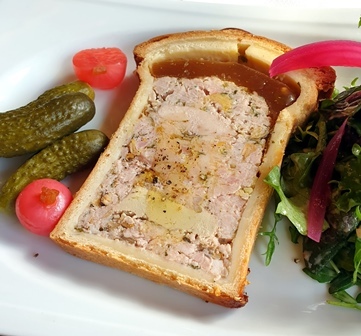 Pour moi ce sera : pâté en croûte et entrecôte. 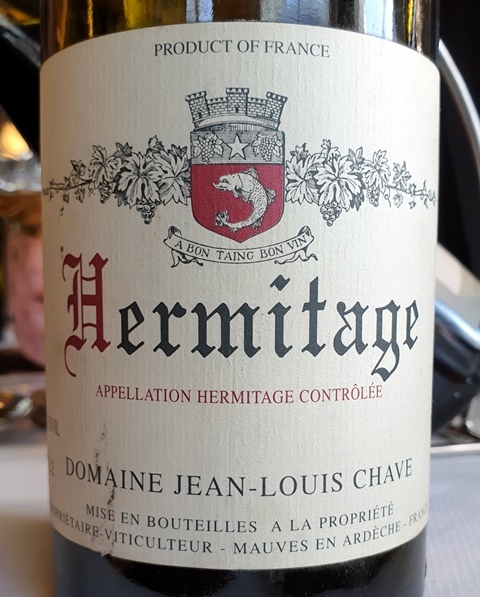 L’ Hermitage Jean-Louis Chave Blanc 2002 a une jolie couleur de miel clair gorgé de soleil. Le nez m’évoque du fumé alors que pour mon ami c’est le tabac qui est en avant-scène. Le vin est riche, ample, gras, et le fumé lui apporte une force de conviction. 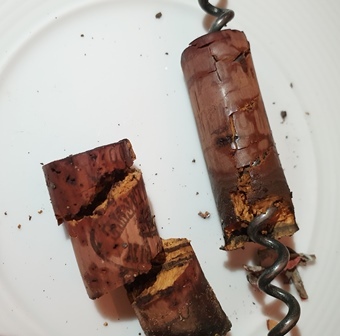 C’est un grand vin gastronomique, solide et indestructible. 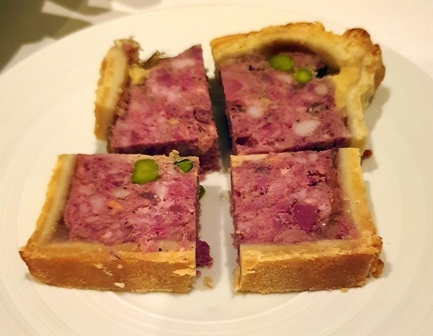 Avec le pâté en croûte l’accord est une évidence. 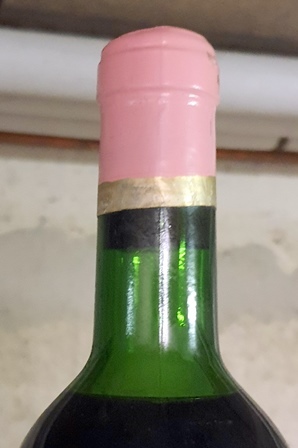 Ce vin a une très belle longueur. 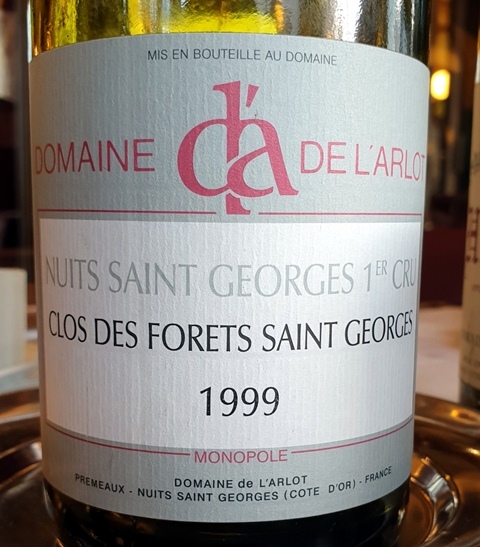 Le Nuits Saint Georges Clos des Forets Saint-Georges 1er Cru Domaine de l’Arlot 1999 a une couleur à peine violacée. Le nez est d’un charme confondant, car tout est suggéré, subtil comme un nocturne de Chopin. En bouche, le vin est délicat, élégant, et c’est un vin qui fait aimer la Bourgogne, si riche en subtilités. 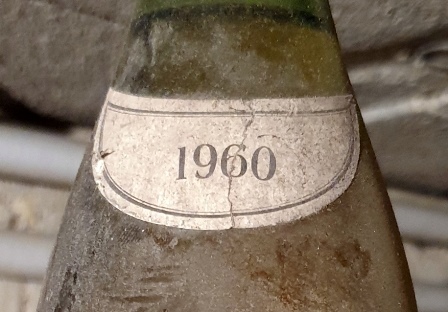 Le vin est si jeune qu’on ne peut imaginer qu’il a un peu plus de 19 ans. C’est un régal. 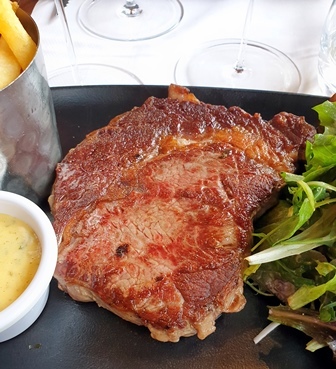 Il vit sa vie sans chercher à copiner avec l’entrecôte. 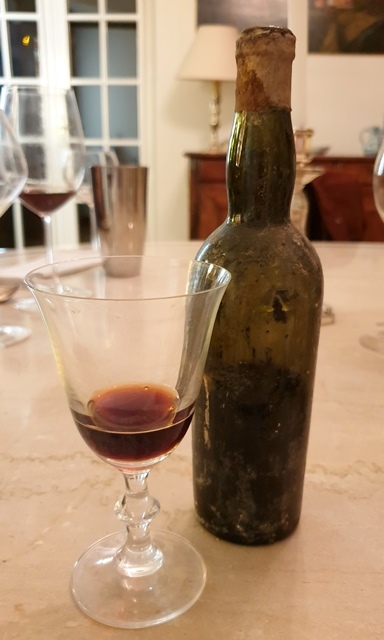 J’ai pris dans ma musette le reste de la bouteille du Vin de Chypre 1869 que j’avais fait goûter au Taillevent à un groupe de grands professionnels du vin. 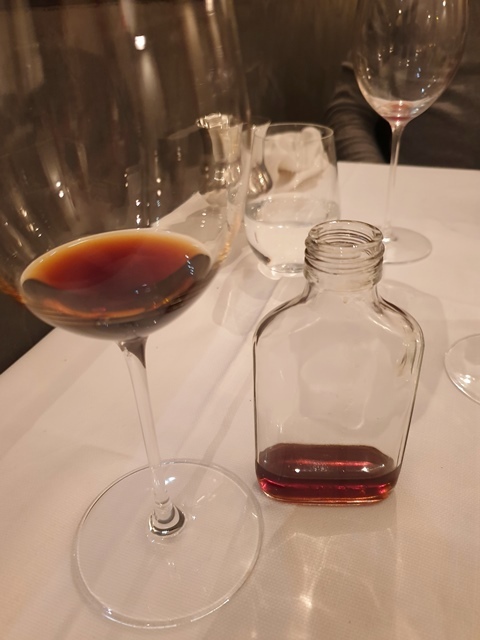 Le dessert avec des fruits délicats convient magiquement à ce vin qui éblouit mes convives. 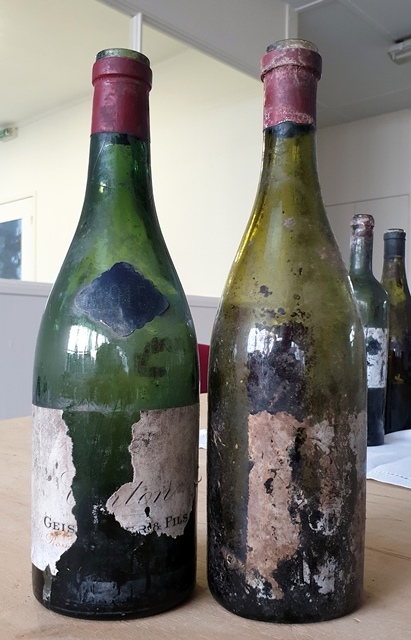 Ils n’imaginaient pas qu’à 140 ans un vin puisse avoir cette puissance et cette présence. 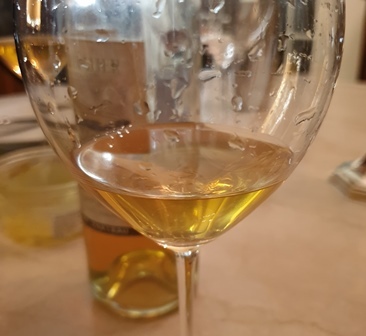 L’acidité du vin est très forte et sa persistance aromatique est infinie. Pour un vin doux, il est sec comme un Xérès et frais. C’est une apparition divine. 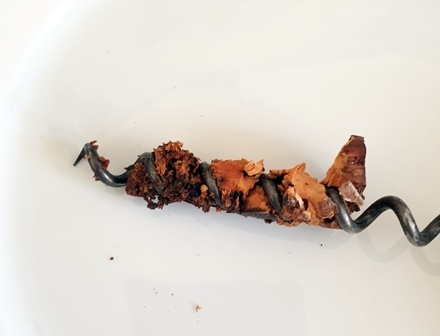 La délicieuse Manon qui a fait le service des plats et des vins mérite de goûter ce breuvage qu’elle décrit avec pertinence. 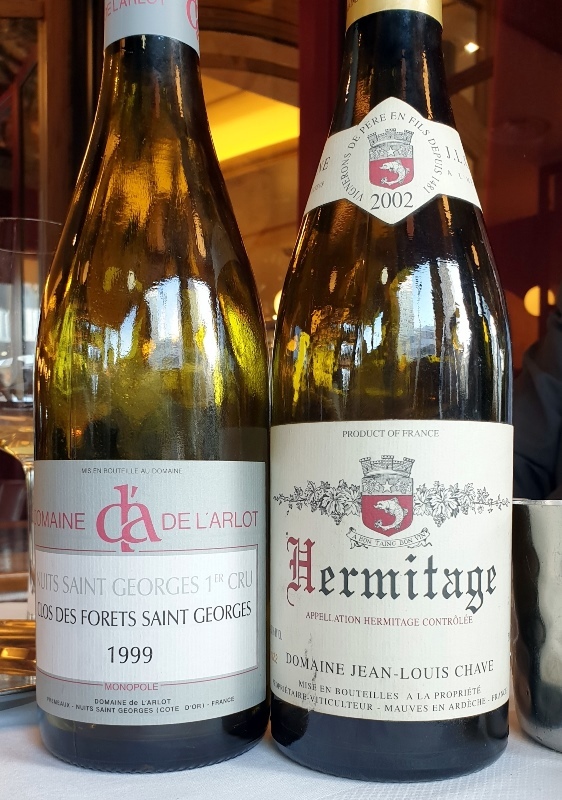 Déjeuner au Petit Sommelier, c’est un plaisir assuré.